bottle of wine as did Jyne Farrell (our permanent nonagenarian). In addition, we invited our #1 Facebook Fan, Joyce Martineau, who faithfully responds immediately to all of our Soup Supper posts. It was lovely having her with us and she jumped right in and tended bar for me while I was busy doing all those little last-minute tasks. So, the soup was Lemony Chicken with Early Summer Vegetables; the original recipe from thecozyapron.com. While I did make changes to fit my cooking/entertaining style it is a glorious recipe and we will make some version of it frequently. Everyone enjoyed it. chopped Pecans. Oh my! They were flat as flat could be and I was totally disappointed. Then, my favorite taste tester came through, grabbed one, and raved about how good they were. I truly believed him since he kept coming back for more and I had to hide them so there would be a few left to serve my friends. Lastly, I decided to make an Ice Cream and Jello Gel Mold in the same flavors as the Gumdrops to tie it all together. I will make it again, but with many fewer Jello cubes and more Ice Cream – it tended to separate (Jello from Ice Cream) when sliced – not bad, but it would have been prettier with more white. It is actual Ice Cream with gelatin so it is refrigerated not frozen! Now I must not leave out my husband’s sentiment this morning which will let you know why he is my perfect soul mate and best friend. You know that NO men are invited to our LADIES Soup Supper. After a couple of weeks of planning, setting and resetting the table, shopping, cooking, cleaning and doing all the things we do when we entertain our special friends, and as we were putting the last of the dishes away this morning, he looked at me and said, why don’t we have company for dinner tonight?! The house is so fresh and everything’s done. After he revived me with smelling salts, I whispered that I thought next week would work just fine! A reminder, keep cooking, use the freshest ingredients you can afford and always take a little extra time to make it beautiful - your family and friends will appreciate your effort! Buon Appetito! So, I noticed that many of my fellow bloggers don't put a date for each blog. hmmmmmm Then no one knows how long it has been in between blogs. I love sharing thoughts, food and information with you so I think I am going to blog everyday - or at least three or four times a week. And then get stuck in "real life" and time passes. Before I host a Soup Supper I spend a lot of time researching recipes. June 8th will be here and we will be serving 7, perhaps 8. The soup will be Lemony Chicken and Spring Veggie Soup and I am also making the dessert which is called a Sparkling Ice Cream Float (gelatin mold). 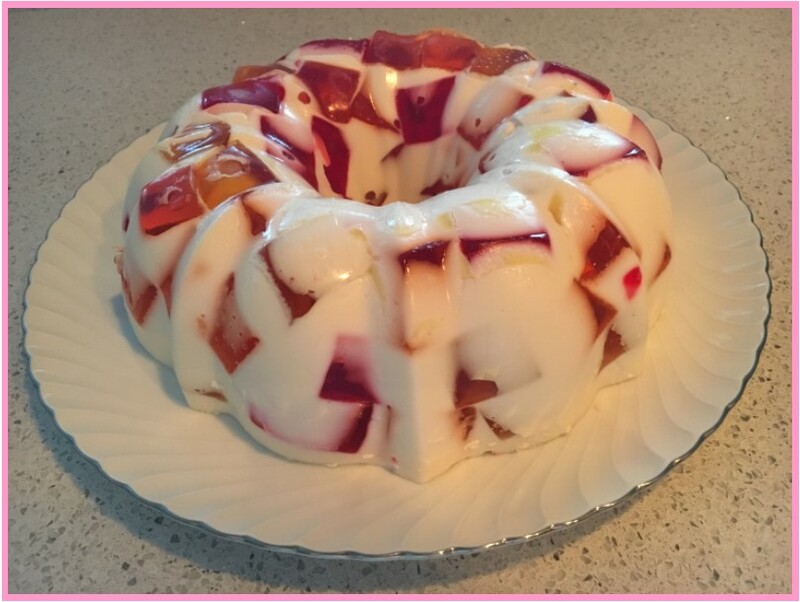 It is gorgeous and is made with Ice Cream, of course - there will be bits of red, yellow and orange gelatin in it which makes it look fresh and summery! 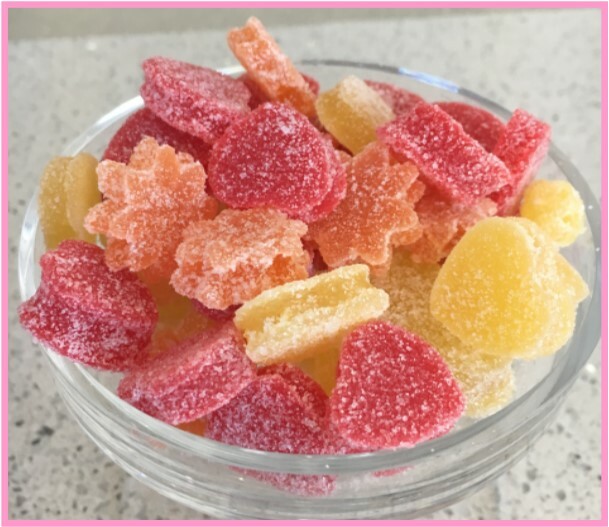 And since I have a little extra time this week I plan to make home made Gum Drops in, but of course, raspberry, orange and lemon flavors as small favors to take home. Look for these new recipes and more in the near future. Also, have just finished my second eBook - the first two will be available by the end of next week. First: Choosing a Venue for Gatherings Second: How to Decorate for Entertaining (full of easy to make and very inexpensive ideas) They are both targeted for the 4th of July but would work for gatherings at anytime of the year - just change the color scheme. Back to work. Hoping your summer is getting off to a lovely beginning and that you're cooking beautiful and nutricious food for yourself and your family. Buon Appetito! I don't get cranky about too many things (at least that's my perception) but a couple of weeks ago I went to Home Depot to find a tool to use for smoothing my cake frosting. I knew that I had seen workmen smoothing plaster but didn't know the name of the tool they used. I approached two store clerks who were standing together chatting and told them what I was looking for. Their comments were rude and sarcastic, recommending that I look in a cooking store for cake tools - neither offered much help at all except to point to an aisle I might try. A very skinny somewhat scraggly young man was stocking shelves and I explained my plight to him. He seemed somewhat puzzled at first but quickly disappeared into the next aisle and came back with a package containing three flat plastic spreaders. Perfect! Although I need a little more practice, the cake is much smoother than earlier attempts, and best of all took me less than 1/2 hour to frost and smooth! I used to struggle for hours. So the tool you will want to have in your supply box is nothing more than an inexpensive (under $5.00 U.S.) spreader, used to smooth plaster. You will not be sorry. I just went in search of a picture to post to you and realized (ugh) that I did not take even one of the entire luncheon I hosted last week - eight friends for coffeecake, bridge and lunch. The cake was another Pink Lemonade Cake (see below) following a Blueberry, Chicken, Goat Cheese Salad served in individual Endive Leaves with a squiggle of homemade Blueberry/Olive Oil Dressing and sprinkled with Toasted Almonds. It is a new recipe for me and one I truly enjoy, making and eating! It is a wonderful summer dish that I will post early next week. So, come back soon, and meanwhile shop carefully for the highest quality and freshest food that you can afford. Make it beautiful and make it gourmet! Buon Appetito! I can't believe it's been ten days since I've posted to you. As usual, you have been continually in my thoughts. I have been working on making very smooth cakes and paying particular attention to making them very level - it gives a very professional finished look. Will get some pictures and recipes up very soon. Wednesday was a luncheon and bridge for eight. A very pleasant day but lots of work involved. And last night was our May Ladies Soup Supper, hosted by Rose Spadaccini. Here's the FB post if you haven't already seen it. Last night was our May, Ladies Soup Supper. 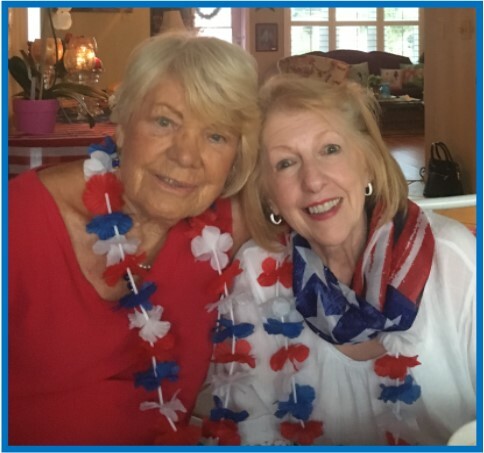 The décor was in tribute to Memorial Day and was hosted by our most gracious Rose Spadaccini. Chris Kravez made a delicious Avocado Bean Dip for our appetizer, followed by a delightful Salad with Strawberries and Blueberries. The soup course was a full flavored Tomato-Zucchini-Corn Soup – just wonderful! Our final course was a white Vanilla Panna Cotta with glazed Raspberries and Blueberries. No Soup Supper would be complete without Homemade Bread, prepared faithfully by our Kay Travenetti. Georgia’s salads are scrumptious. We were honored with the presence of Lynn Frederick of Chatfield, Minnesota, daughter of our regular Jyne Farrell and my sister-in-law. So, my dear friend Rose hosted Soup Supper this month and I thought I'd surprise her and make my first solo ride to her house on my scooter. She, of course was busy tending to her guests and last minute stirring, tasting, checking and missed the whole ordeal. By the time she was free, *hubbie* by prearranged agreement had motored the scooter back home. Just purely a good time with the girls. I am greatly looking forward to having a few days free to write a recipe or two. 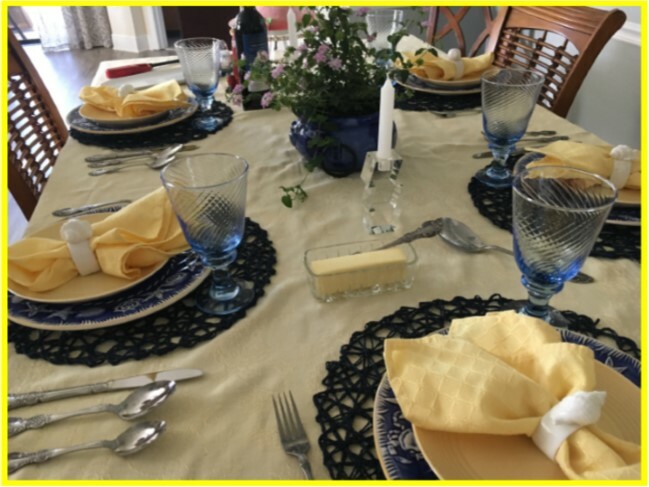 I have finished my first eBook which as yet not formally named, but having to do with how to choose the perfect venue for entertaining a picnic or cookout for both small and large numbers of guests. The next one will be festive drinks, both with and without liquor. If there is anything you would especially like me to try, to test, to develop, please send me a note. Meanwhile, remember, it really is o.k. to play with your food, especially if you are making it even more beautiful. Eat well. Cook well and come back often! Buon Appetito! makes the delicious bread) and I generally prepare the dessert. Good wine is a permanent beverage! It is a lovely evening with intimate girl talk, laughter and sometimes a game. This month we played Dominoes. No one wanted to end the evening but exhaustion won out! Now, about the Pink Lemonade Cake. Everyone liked it - even the light eaters ate every bite and a couple went back for a second taste. However, and this is a BIG however, *hubbie* who loves sweets in general and mine in particular, did not care for the labor intensive Swiss Buttercream Frosting! So much so, that he never went back for the piece I brought home for him. I thought it was lovely and light. He didn't think it was sweet enough and rather tasteless. So, I have decided not to post it on my site - if you really want to try it, you can find several good recipes on Google - even a couple with videos. Next month, I plan to make a light white cake with a whipped cream frosting decorated with glazed red raspberries (or strawberries) and blueberries. 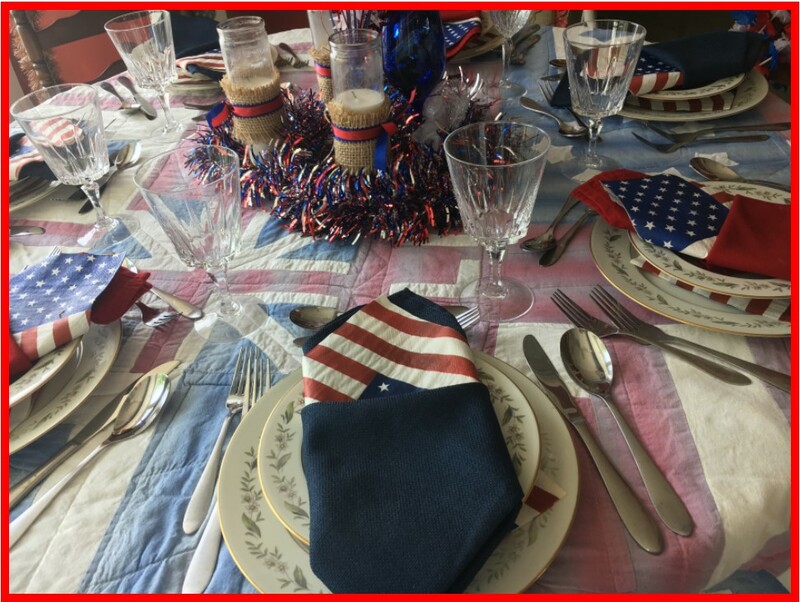 The theme is planned for Memorial Day and so the Red, White and Blue colors in the U.S. would be fine - for other countries just find the fruits that match or compliment your flag for your special days! I love it when you come to my blog frequently and especially when I receive a little note, question or suggestion from you. You are very special to me and are with me whenever I am in the kitchen - always hoping to have something new to offer OR a piece of good kitchen advice. Remember, keep making those beautiful dishes for your family and friends. It is an art form of love. Buon Appetito! The cake was a tremendous success at last night's event. I always know for sure by how many go back for another little taste. Even our very light eater ate every single bite on her plate. this cake. First and foremost I will make certain that the batters for each of the two cake rounds are significantly different in color; if you look closely at the picture above you can barely see that there are two different layer colors. Not nearly enough to give that dramatic pop - and the effort to make it happen would be so small. Likewise, the difference in frosting shades should have much more contrast. Then when you begin smoothing the frosting together the gradient effect is much nicer. Although it will take practice getting it "perfect", the end results along the way are spectacular and will be met with ooooh's and ahhhhhh's by family and strangers alike. In fact, I decided at the last minute yesterday that I wanted to add a very few leaves for contrast with the roses. Rather than make a batch of frosting to tint green in the limited time I had, I went to our wonderful Publix grocery store because I know they sell freshly made white frosting in their bakery. When the baker discovered my need, she not only offered to tint a small amount of green for me, she also placed it in a parchment piping bag with the end cut to make a leaf shape. I showed her the picture of the finished albeit leafless cake, and she just LOVED it. She said that I could have made the top smoother if I had heated my spatula and I'm sure she was right. Next time I will. But she thought the design and major part of the execution were quite good. How happy was I? Very! So, if you have an idea OR another dessert you would like me to try and review, leave me a note on the card below. Meanwhile, make those meal designs beautiful and use the best ingredients that you can! Buon Appetito! Just a quick note to you - this is our girls Monthly Soup Supper and the Pink Ombre Cake is my contribution. 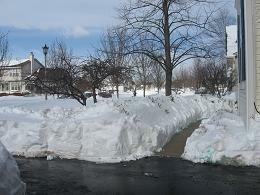 I promised to post a photo yesterday, and as you can clearly see, I'm a day behind and will be leaving in 45 minutes. While I am well pleased with this first end result, there are many flaws however all can be managed. Making and working with Swiss Buttercream is a wonderful experience and I am looking forward to developing more skill with it. To the right are the frosting colors directly over the crumb coat. It would have been better if there was more of a difference between the three pink colors. In the photos of the finished cake, you really can't see the gradient well and even in person it is not a strong difference. We'll talk more about it later. Right now it is time for me to change into my pink blouse, add a bit of lipstick and smooth my hair. The girls will be picking me up shortly. Hope you have a wonderful evening and are busy preparing delicious, beautiful food, for yourselves, your family and your friends. Buon Appetito ! The Meringue Buttercream is quite a bit trickier than the Buttercream we make most frequently, but trust me, oh so worth the while. It actually tastes really good, is smooth and creamy with a wonderful consistency. When you make this, I strongly advise you to do it in two days. Bake the cake and torte it the first day. The second day you can have fun playing with the icing colors. I am absolutely exhausted but wanted to let you know how it went today. Keep cooking delicious and beautiful food! Sorry about the color - but with our warm breezes and my playing with Pink Lemonade, I am just happily submerged in PINK! 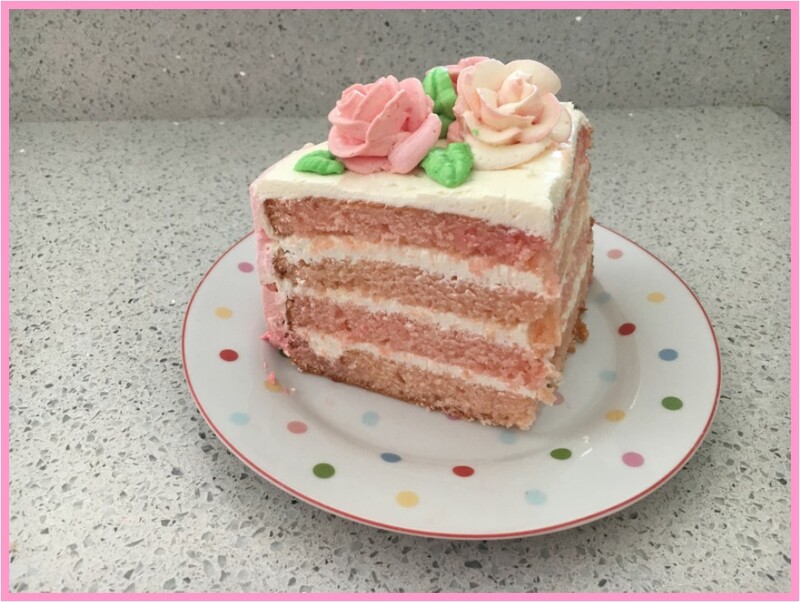 I just got the Pink Lemonade Frosting posted and wanted to make certain that I let you know I found this particular recipe (after going through MANY) from twosisterscrafting.com, a very nice site with a lot of really good information on sweets: how to make them good and how to make them beautiful. 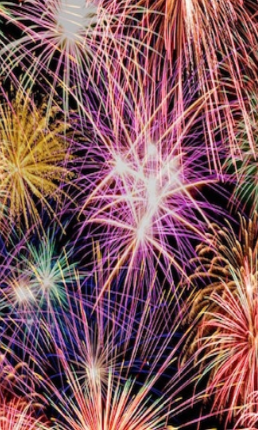 I continue writing my series on a great 4th of July (or other picnic/cook-out) summertime party. You will be able to purchase individually any one of five Chapters of my book: Venue, Drinks, Decorations, Food Recipes, and of course Fun and Fabulous Desserts. These will be complete with instructions, pictures, how to's and a few secret cooking tricks. They will be available in eBook format that you can just quickly print out from your email! So, this evening I am making another Pink Lemonade cake and I came up with a REALLY good idea. I am making two recipes (four layers) and can make a very tall cake, two medium cakes or any combination I choose. This will take some of the anxiety out of getting the two layers cut in half perfectly. And, remember I plan to try the French Buttercream recipe (Pink Lemonade flavor, of course) to frost into an Ombre design. I should have some fun pictures during the week. Hope you are enjoying early spring weather and are looking forward to good cooking, healthy and beautiful. Buon Appetito! 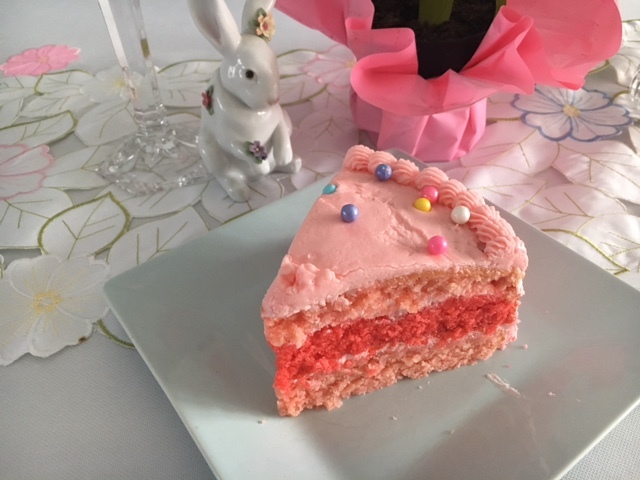 Wednesday I will post the recipe for Pink Lemonade Frosting although this cake is delicious with a nice Buttercream and would be good with Buttercream Cream Cheese as well. You also might try stylesweetca.com for a beautiful Ombre look and recommendations for a frosting. As always my dear readers: keep it healthy and keep it beautiful! What a lovely day! The weather was gorgeous, church was a blessing and our guests were lovely. 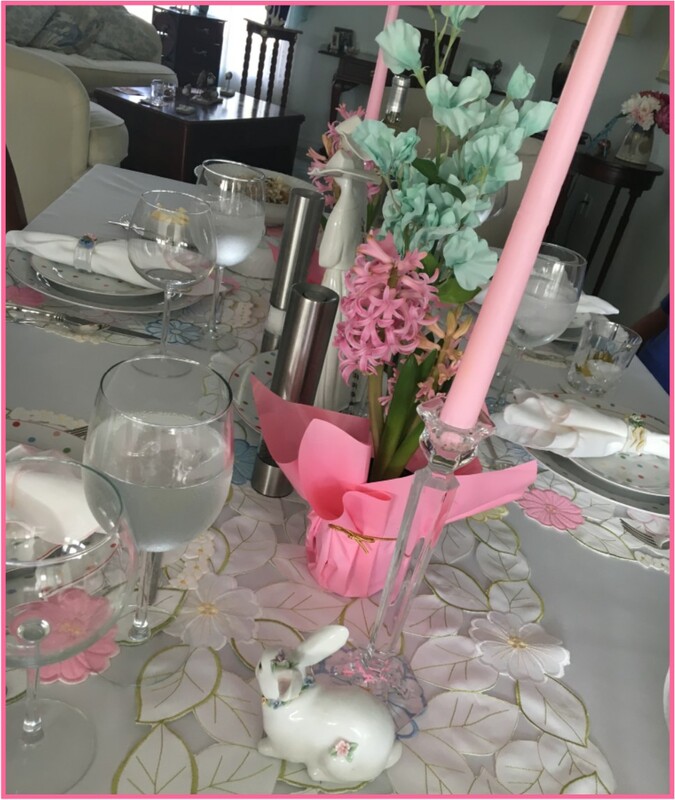 As you can see from the picture on the right our Easter Table setting colors were pastels and simple although a bit elegant. We used what we had including a set of polka dot dishes that we retired some years ago. The menu was also quite simple this year with a Spiral Cut Ham, Baked Beans, Roasted Potato Salad, Pineapple-Carrot Salad, Broccoli Slaw Salad, Dinner Rolls and several desserts. The only slight complication was the Pink Lemonade Cake. to pour four cups of batter into one prepared pan and add a little more color to the remaining batter which I dutifully did. When I placed the darker batter into it's prepared pan, I found that there wasn't the same amount of batter. Since the two individual cakes were to be cut in half yielding a four layer cake, I was woefully short and ended up with a three layer cake. 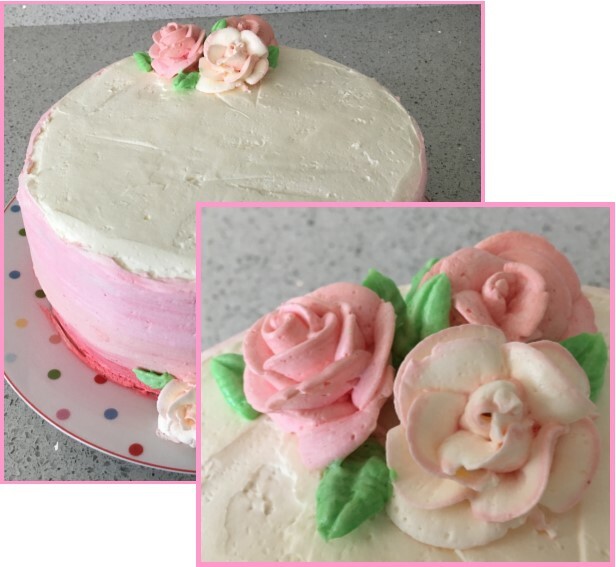 While it was pretty and the flavor was quite fresh and pleasant, my plan was to frost it in pink Ombre and there was not enough height for that technique. So Caution: for my recipes and any others that you select. Check the details ! We do our very best to give accurate information and provide all the little details, but errors do occasionally occur. If you request via the comment card, I will give you a list of my favorite recipe writers whom I greatly trust for both content and technique. And, for your information, the Pink Lemonade Cake was delicious plus I did serve Chocolate on Chocolate Brownie Bites and Chocolate Dipped Strawberries, just in case! I hope your weekend was indeed blessed. 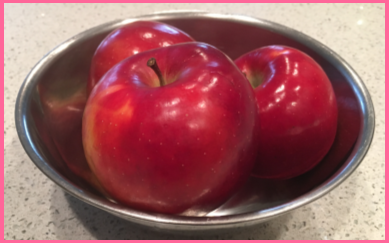 I am still looking for Apples and fabulous Apple Recipes but will be starting a series on a Summer Picnic Event and for those of us who reside in the U.S., a Fourth of July Party! Let's chat again soon ~ remember, make it healthy and make it beautiful! So, exactly where does the time go? It seems like just yesterday when I posted last, and we can clearly see that is not the case. I am still working with Apples and have tested the new Champagne-Apple Panna Cotta recipe I wrote which met with rave reviews! I should have it available soon. It is always such a happy thing to be able to offer you a brand new recipe! It seems as though the "apple dry spell" is over, at least in my area, and some of the nicer and newer varieties are once again available. I just purchased a couple of Envy, a very nice flavor, but they are HUGE and I prefer the small ones! No change in flavor but I can't finish the really big ones and hate to waste. Below you will see that I have created a Comment Box to make it easy for you to share your comments. I am especially interested in what apples you are finding available in your markets and which you especially like and why. It will help us all with the many apple recipes we make! I wish you a blessed Holy Week and Happy Easter! Keep cooking, healthy and beautiful foods! Just a quick little post. Believe it or not, I think of you often throughout the day - I have written a brand new recipe "Apple Panna Cotta with a marvelous Twist". It is perfect for fancy company dinners or the family with delicious flavors and over the top presentation. Will be working on making a how-to-do-it video. Meanwhile, still in search for the perfect apple to use. If you have suggestions post a comment to me at AppleAnnie.blog. Having so much fun thinking about bringing you a brand new recipe which will help you to be that Everyday Gourmet we strive for. Bon Appetit and Happy Cooking. Yes, yes, I am still on the topic of apples and am learning not only about this ancient fruit but many things about food ingredients, flavors and textures as well. Things that can contribute to that special Everyday Gourmet level of cooking that we strive for. We so often accept recipes as written without challenging the ingredients that go into them. For example, I always use three different varieties of apples in my Applesauce Recipe, but am never specific about the types or even a recommendation of type to use. 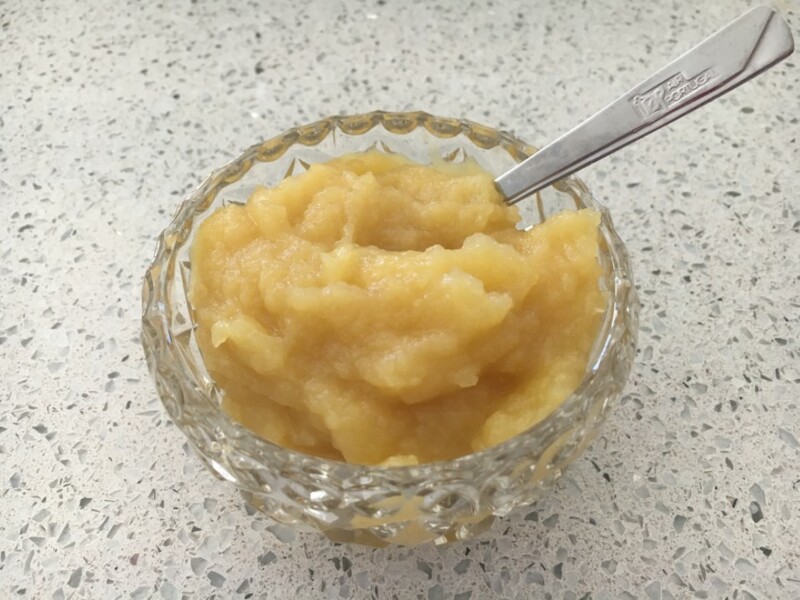 Last week when I made the Pazazz Applesauce for the first time, I began to realize that the flavor was exceptional and yielded a flavor profile of its own. Eaten by itself the importance is somewhat diminished, either you like it or you don’t. However when you use it as an ingredient in another food, its relevance can be clearly seen. I LOVED the taste of it. When I added it to my Nutritional Breakfast Cookies, it was unbelievably delicious. It softened the texture and added natural sweetness. 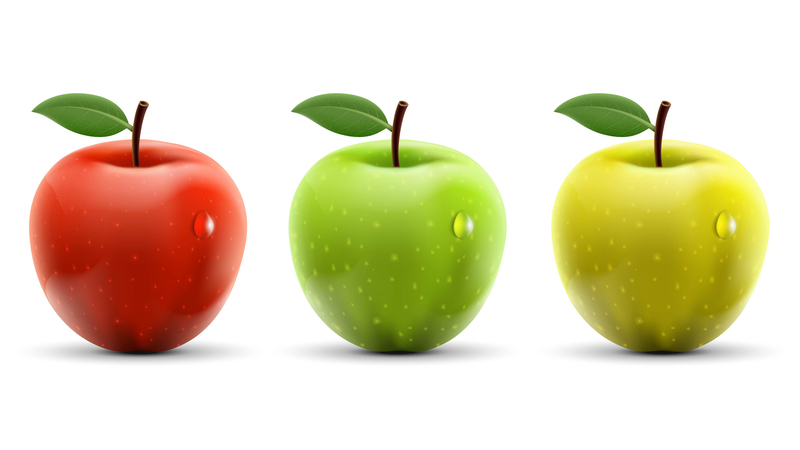 So the flavor/texture of the apples we use would greatly impact many of the foods we make, i.e. 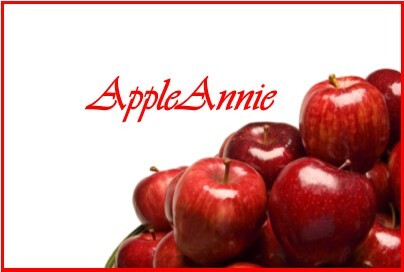 Apple Pie, Apple Kugel, Apple Crumble, Apple Tortes, pretty much any recipe that includes apples. So, now our search for the tastiest Apples takes on new meaning. Let's look together AND we will expand our new knowledge to other fruits and vegetables we use in cooking! So, as promised I did try a Ruby Frost as well as an Opal apple. The results were surprising since I expected to like the beautiful Ruby Frost and quite frankly, in my world, it was bleccccck! Not good. A little tart (not a fan of tart) and a little bit of sweet, but not especially pleasant. The experience for me was on the yukkk side of the middle. Now I have to convince my *hubbie* that he should eat the one remaining in the bowl. Better offer it before he reads my post! Now, I did not anticipate liking the Opal at all since thus far my preference has been red and red striated apples. This Opal was quite down the middle, but in a good way. Slightly tart, slightly sweet. While not at the top of my list (Pazazz still remains there quite alone) it is an apple that I would eat. It might be an interesting combination in a Waldorf Salad with perhaps a sweeter apple. I will try this tomorrow and let you know. Or, if you have the time you might want to try it first. Hope you are staying warm and have a blessed weekend. More recipes next week - I have a couple I am working on. Bon Appetit - Happy Cooking! Today was the last little Pazazz apple for this season. The picture on the right are Ruby Frost apples. I found a lovely interesting looking medium sized apple called Ruby Frost. That was my choice for the day. Also there was an apple I hadn’t noticed before named Opal – an interesting pale yellow color. I have already mentioned that Snap Dragon is near the very top of my top ten list so I would imagine that Ruby Frost will be another delightful apple choice for us. I’ll let you know tomorrow. I was not always a lover of Apples, no matter how good they were supposed to be for you. And applesauce? Well, if you put enough sugar in it then perhaps it was edible, however it was the funny texture and the sugar that I always tasted. And, if you had to load it with sugar to make it palatable it was no longer exactly a health food, was it? Well, things have certainly changed! 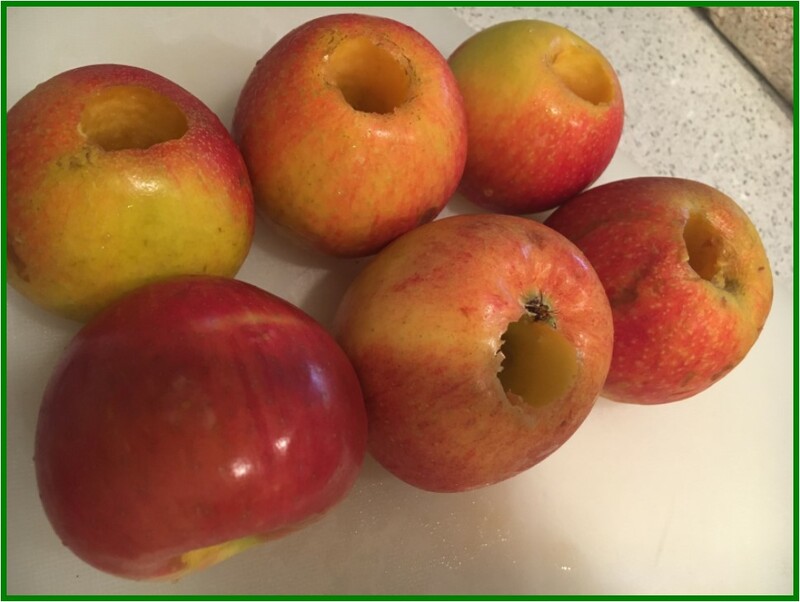 Last night I made a small batch of applesauce using Pazazz Apples to make an ingredient for my Nutritious Breakfast Cookies. I was truly amazed. They are a small apple so I cored, peeled, chopped and simmered six of them. Instead of the usual 1/2C sugar I used only 1 TBS and the next time I make it will likely omit the sugar entirely since the Apple is so naturally sweet. Believe me, the end product was truly delicious - whiter than most Applesauce and it blended extremely well, leaving a delightful texture. Do give it a try. I am so happy to be back posting and working. This afternoon I am baking a new version of a Nutritional Breakfast Cookie which I have adapted from a recipe by Leelalicious.com. Whether you look up the original or use my adaptation, you will be delighted in the flavor and amazed at how such a small portion of food can be so filling and so healthy. This picture was taken February 27, 2017, just two weeks ago. 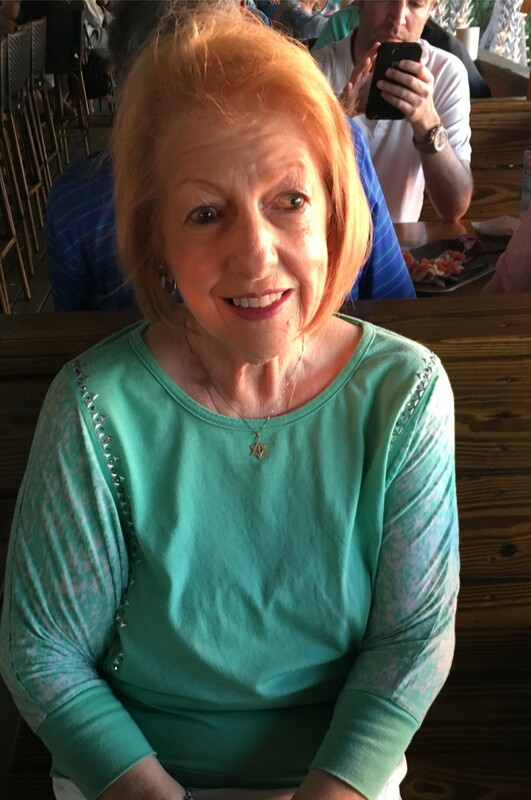 The picture below was taken February 20, 2016 at one of my favorite outdoor restaurants with a group of my friends around the table. We were celebrating my 69th birthday. Two days later I was rushed to the hospital where I lost 7 units of blood and was admitted to ICU. And after several transfusions and many IV bags of various fluids they finally brought me solid food. I was so anxious for food! however, I will never forget the shock of what was on that tray: Jello (2 containers), Fruit Juice (high sugar content), Sorbet and a bowl of powdered broth with a lot of salt. The only thing I managed was a cup of not terrific coffee. I called the nurse, certain that there must have been an error. She assured me there was not. I refused to eat until I was released. My diet was primarily Vegan and rather strict. As I left the hospital, armed with insulin, a battery of oral medications and little in the way of instruction except for the medications, I had no plan. This was me one year ago. A young, female physician had spent a good deal of time with me throughout the week, asking me about myself, listening and encouraging me. She told me to figure it out and to move my body. Not to worry about heavy duty exercise, just keep moving. I asked her how to give myself insulin injections and she said Google it! I did just that and began taking full responsibility for my body, the Diabetes and my life. For some reason my meatless body craved red meat. When hubbie asked me what I wanted for dinner the first night home, I assured him without hesitation that I wanted a thick, rare steak. He almost fainted! Ever since that day I have eaten all food groups, paying attention to nutritional value, calories mildly (no major counting, just an awareness) and never eating to the point of real fullness, learning to be satisfied with not being hungry as opposed to having a full or stuffed feeling. 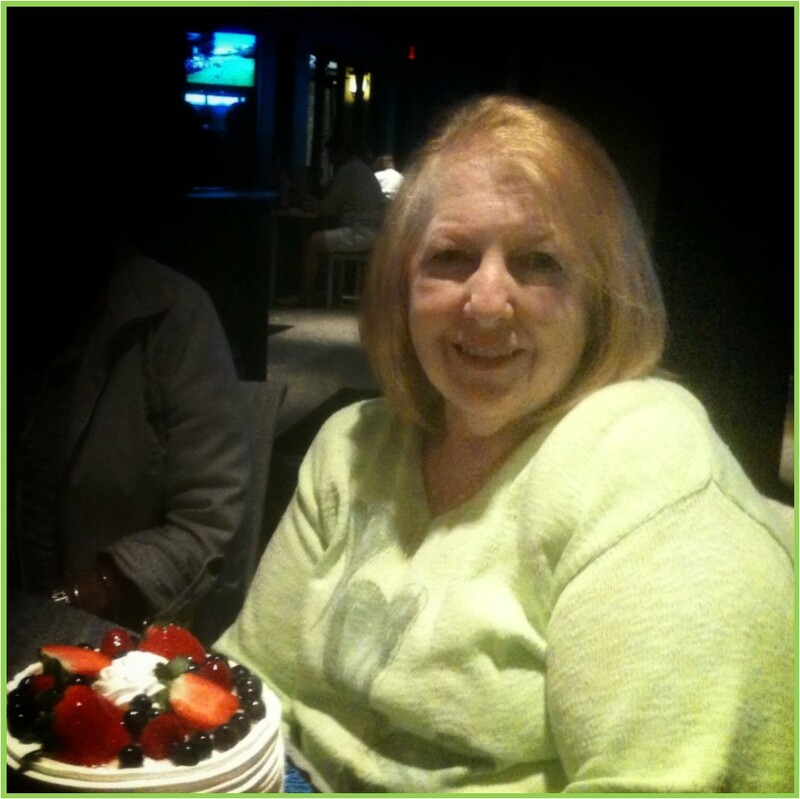 I plan to start another blog about my experience with Diabetes, going from an A1C of 12.6 to 5.6 in eight months and losing 58 pounds. Many, many thanks to my faithful recipe readers. Do look forward to new recipes with over the top, professional ideas which will be available to take your efforts to a whole new level! 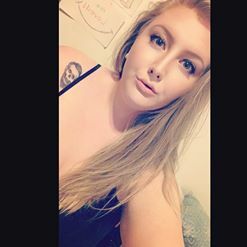 My youngest granddaughter Bekkah, has done a wonderful job learning about nutricious, healthy food choices and looks marvelous. So, good healthy eating and positive choices really do yield excellent results. See the blog below. 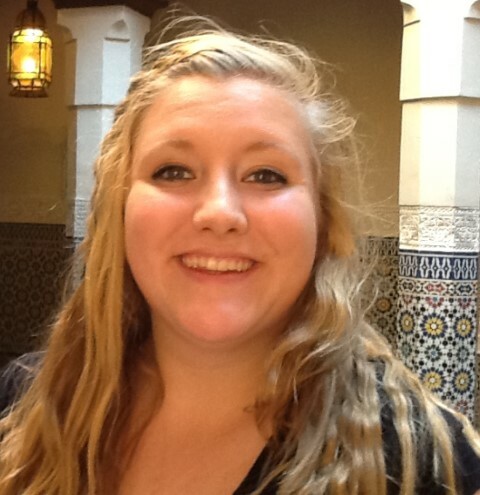 My beautiful youngest Granddaughter announced to me over the weekend (messaging since we live several states apart) that she intends to be a healthy eater and would be interested in beginning a Vegan lifestyle. I think it is absolutely wonderful that young women and men have so much dietary knowledge available to them and can prepare their bodies for a healthy, energetic and productive life. It is such a good idea to learn good eating habits at a young age. I recommended to Bekkah as I do to you, my readers, to familiarize or refresh yourselves with the section Food for Thought. 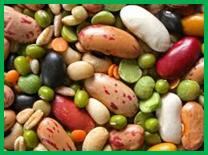 Also Purchasing Healthy Food may be helpful - Dried Beans page is a must if you're not drying them currently. Bekkah has assured me that she will keep us posted as she begins her journey, so we can reinvigorate ourselves as we learn from her newness! It's a good month to start those lists of refreshing summertime meals and check your local produce stands and vegetable markets for current best buys until your first harvest is ready. Don't forget that small yard and even balcony gardening can reduce food cost and give you much pleasure when you harvest just before tossing that salad together! Summer is creeping upon us, and with it the fragrance of fresh cut grass, muscle warming sunshine and blue skies. 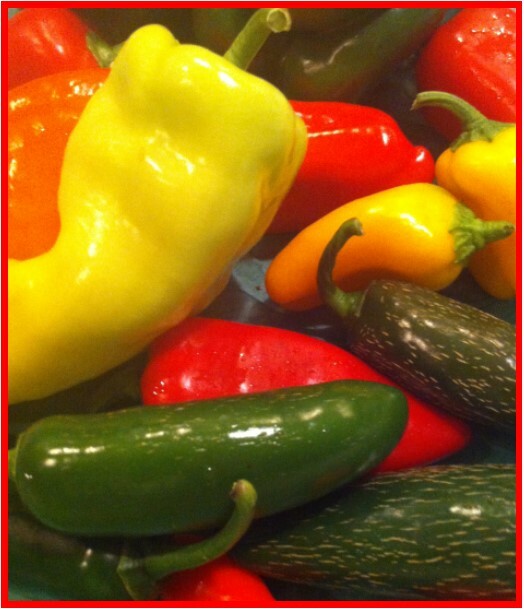 Soon our gardens and markets will be filled with the gorgeous colors of fresh peppers of every size and kind as well as lettuces and a wonderful array of vegetables. Let's make a commitment to eat a little healthier and focus on a plant based diet with more emphasis on color, texture and flavor. Vegetable Lasagna, Cioppino (with or without fresh shellfish), Buffalo Cauliflower Wings as well as Smoothies, Soups and Salads! Check back frequently for new recipes and my personal version of Mile High Lasagna Pie. Everyone loves it! Let's get cooking, healthy style! I'm back! What a time crunched whirlwind we've been in since last we blogged. We were in California in May returning the beginning of June with, of all things, viral pneumonia! Hubbie was ok but I ran a fever on and off for three weeks and then returned to work to experience the final blue screen computer crash dump! Managed to get all backed up, lost no pictures and of course SBI maintains my site perfectly and at all times. In California we visited my sister and brother-in-law, Babetta and Roger Wilson who also live a Vegan lifestyle. What fun. The picture to the right is Babetta's version of snack chips, called Betta Chips, served with delicious Hummus. What a healthy way to curb that late afternoon hunger, both healthy and satisfying. Now, this picture is done by happy little Vegans, washing beautiful vegetables picked fresh and purchased by us from a CSA (Community Supported Agriculture) Farm. Unless you can grow it yourself, it doesn't get any fresher and has the added benefit of supporting your community. When we returned home (the opposite coast) we did a little research and found a local CSA Farm for us! We lightly sauteed these lovely vegetables in a scant amount of Olive Oil not overcooking them. Served with a delicious whole grained bread, it was just delicious, unimaginably filling. Of course we finished the meal with our delicious Black Bean Brownies (mix available for purchase). It has been some time since I have managed to blog. Things have been difficult and quite sad here. Our precious Miss Kitty who LOVED our cooking was diagnosed with a terminal illness in November of last year and required a good deal of extra care these past couple of months. She died March 31st and believe it or not, we still miss her sweetness every single day. Additionally the issues I have been struggling with on my computer nearly cost me my entire system. My computer guru Eddy, MicroTek, never speaks crossly to me and knows that I keep my files in good order. This time he made an exception and felt that I put my work at great risk. Thankfully he is grand at what he does, and things are working properly once again! Although not blogging, I think of you everyday and have managed to create and deveope some wonderful new tastes for summer. met with rave reviews at Bridge Club last Thursday. The flavors are fresh fruits or vegetables and herbs and yield refreshing and interesting tastes. Plus, they are gorgeous! Unfortunately in the picture above appears to be cloudy -- in reality it was clear and sparkling. Am making more tomorrow evening and will try to get better pictures. A special, special thank you to Bud Marion who notified me that there was no quantity listed for the tomatoes in the Roasted Tomato Soup recipe. It has been corrected. Spent the morning reorganizing the Nav (Navigation) Bar for you. It seemed like the specific recipes were getting difficult to find, even for me. (Yes, I do refer to my own recipes from time-to-time to remind myself of timing and tips.) Unfortunately, I do discover numerous typos which always makes me blush. I do attempt to get onto my site quickly to fix them. If you glance over to the right you will see several new divisions. No recipes have been removed, only relocated. Hope this helps you! Just a little reminder to take a bit of extra time to garnish your creations. You don't have to make a Tomato Rose for each individual you are serving (although that is a nice touch if you have the time). Just add one to your serving bowl for wonderful color. 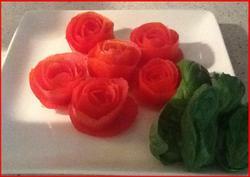 The plate pictured are six roses I made for the luncheon last week with a handful of basil to serve as "rose leaves". They can be made several hours before serving, or even the night before and refrigerated. Did I ever tell you about the time I made a GORGEOUS Carrot Cake with lovely little Carrot Curls? Made it the night before and went to sleep with my heart singing because it was for a special person. When I awakened all the little curls had dried, hardened and turned brown. YUK! I had just enough time to make new curls (ice water bath) but what a shock it was - simply didn't think that through. Back to work. 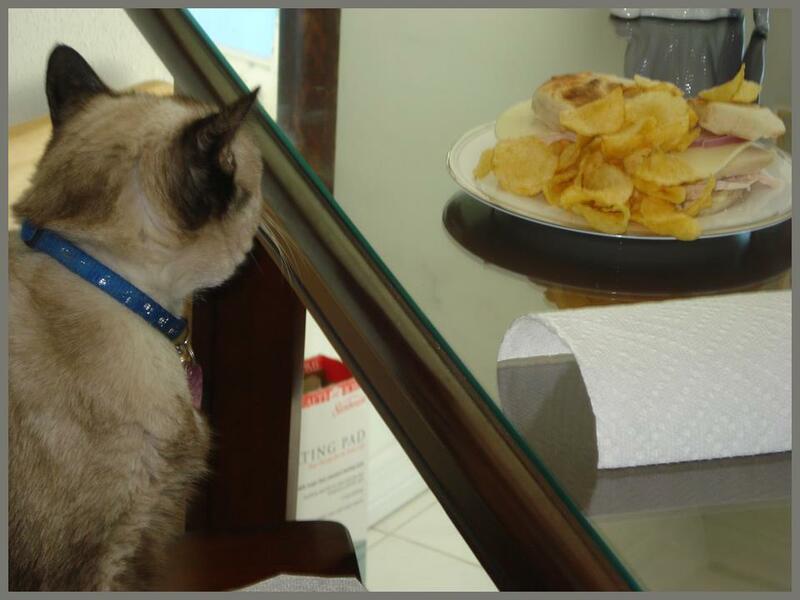 I would like to get this second Tuna Salad posted for you this afternoon. The last time I served it for company there wasn't one bite left on any of the plates (and there was plenty of food served so starving guests wasn't the reason!) 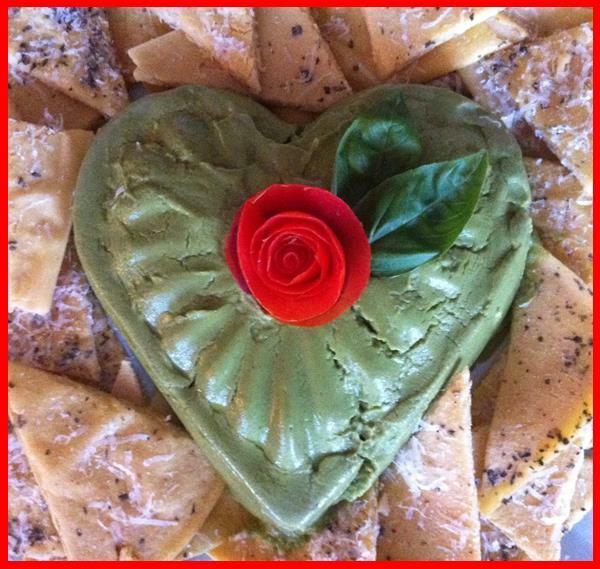 I made extra so *hubbie* and I each had a big serving left for dinner - he loved it as much as my guests. It, like the one I posted yesterday, starts with grilled Ahi Tuna. Buon Appetito! 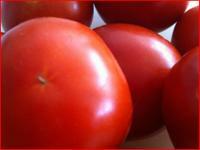 Make your meals healthy, an act of love for those whom you love and don't forget those lovely little Tomato Roses! Don't forget about Vegan Chili. It is so good to have on hand for a very quick, special dinner. Eat it by itself, with a couple of Hummus Chips on the side, in a wrap with Tomatoes, Lettuce and Onion, on top of a Bed of Lettuce or add a large spoonful to your Veggie Bowl. We make our "big batch" mild and then add spices and heat depending on how we are serving it, sometimes adding more vegetables such as mushrooms, onions or corn. We always have some in our freezer. 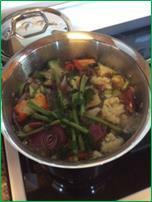 If you scroll down a couple of posts you will see a picture of my stock pot with the simmering vegetables that made our Vegetable Broth for this week's menu. This one, however, belongs to my brother-in-law, Donn, who has made the commitment to a healthy eating lifestyle. I emailed him to find out how the final broth turned out and received the following reply "Great, I used some in my soup, it is a great idea. Thanks." So what can be better? 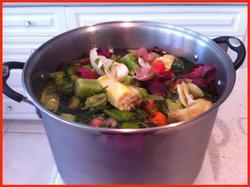 A delicious broth to enhance your soups and stews made from scraps that you would normally throw away! And, if you or yours are looking for a quality custom Saddle, go to Donn's Leather Works @ DonnsLeather.com. For custom Saddles and accessories - anything needed to tack up your horse. 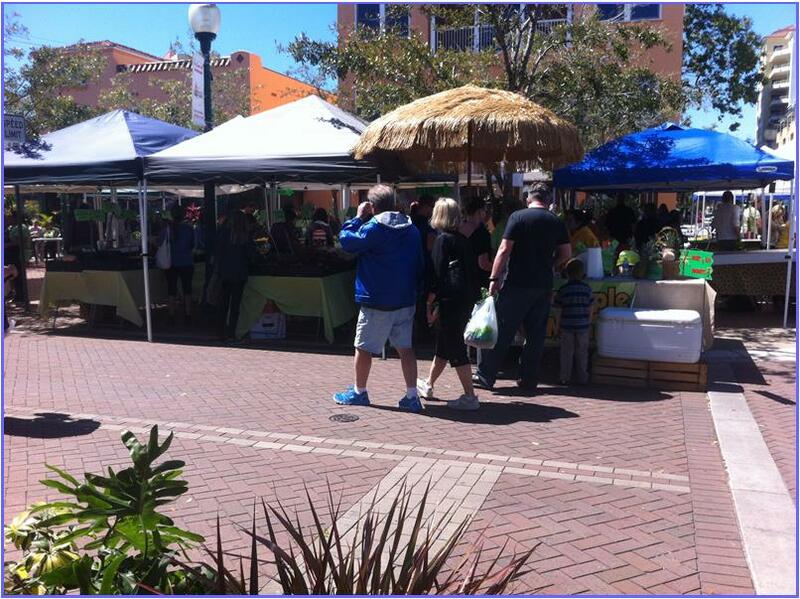 Last Saturday, after browsing through our local Farmer's Market, I thought it would be a good idea to talk a little bit about how to begin making the change to Healthy Eating. It may seem a little daunting at first, but once started it actually becomes quite a pleasant adventure. Fresh fruits and vegetables are beautiful to look at, simple to cook and the health benefits are remarkable. 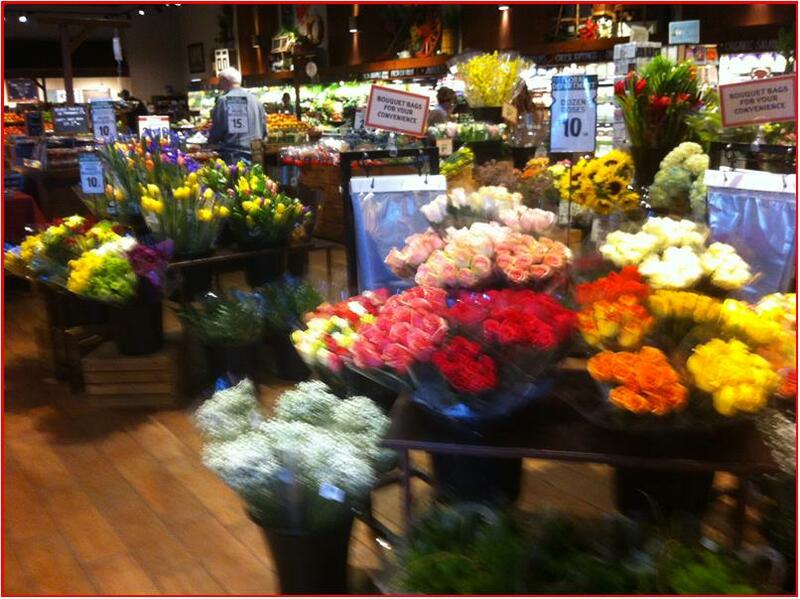 We ended our rather long day at Fresh Market where we found everything we were looking for, and of course, more. Visit our page Purchasing Healthy Food to get some ideas on how to begin shopping "healthy". We bought a couple of items that we were not familiar with (you may recognize them). Meanwhile, shop and cook healthy for you and for those whom you love. And, always take a few extra minutes to add the beautiful touches that will make you the Everyday Gourmet. Since I last wrote to you our kitchen has been warm and toasty with the wonderful aromas of fresh, healthy cooking! It was so much fun with my sister-in-law, Lynn, here for the week. From sipping coffee together at dawn to a little dinner party and a luncheon, it was a very busy week. I promised to post this recipe right away and in the middle of connectivity problems requiring a run to the computer store for an adapter and installing it, I managed to keep my promise. Glad you made it home safely, Lynn - miss you already. 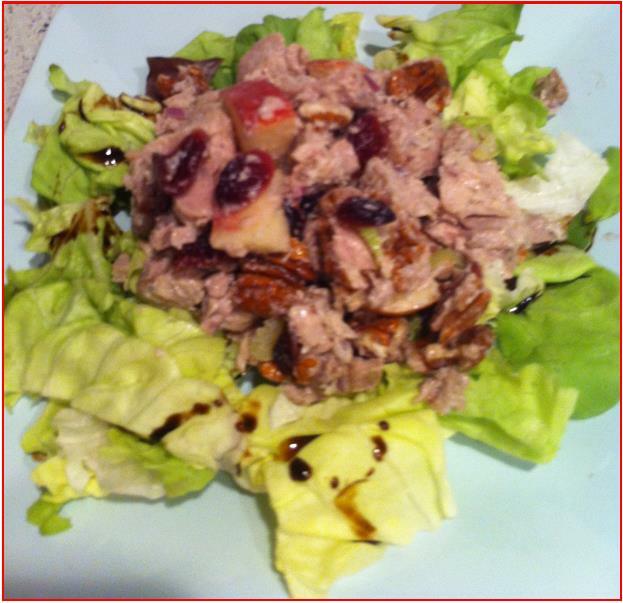 Coming up next week are a wonderful Tuna Salad, different and delicious, ideas on cooking Steel Cut Oats plus a Soup Base that you can add anything to. Wishing you warmth, good healthy food with the reminder always, keep it fresh and take the few extra minutes to make it Gourmet, Everyday. More gorgeous colors! And this is bags of "garbage": the peel from vegetables past, corn cobs, leaves, stems, lettuce bits, zucchini, onion skins and whatever else constituted waste as we prepared our vegetables over the last month. 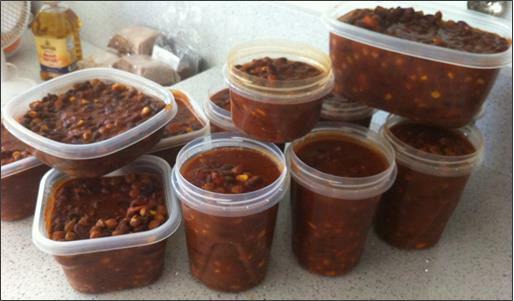 We were astounded by how many bags we had crammed into our freezer - enough to fill a 16 quart pot! We generally do not wait this long and end up with 4 - 6 quarts. When I awakened this morning I decided to make homemade bread but the house was a little cool. Cooking the Vegetable Stock was a great way to get the kitchen toasty warm with a little humidity so that's how the project began. Our home smells awesome with the cooking vegetable aroma combined and the yeasty bread that is rising. And savings? Two loaves of homemade bread will cost about $2.50 each and the Vegetable Broth? That's free using pieces of vegetables that most people discard. We generally do not consume a lot of yeast bread made with flour, but *hubbie* really enjoys it and I like making it. So, today is a special treat. 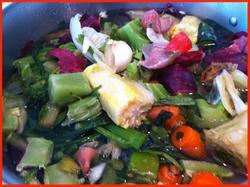 The vegetable broth we use in soups and stews. Tomorrow night we are having Cioppini once again (you know that's a favorite in this house) and the fresh broth will add a wonderful, deep flavor. I am working on getting the Bread Recipe (with detailed instructions for beginners) and the Vegetable Stock Recipe. They should be up by Monday or Tuesday at the latest. Wishing you a very blessed weekend. 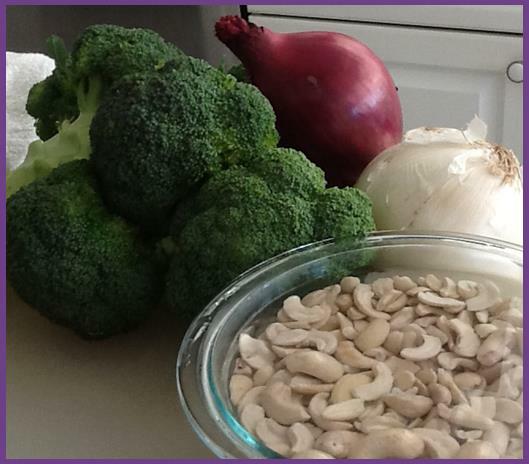 Do make healthy eating choices and when you're cooking take that extra few minutes to make it fresh and from scratch. That way you KNOW exactly what you are putting in your body to promote good health (and, of course, great taste). If you check into my site often you will have surmised that I LOVE color and texture. 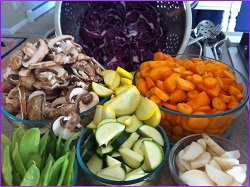 The gorgeous colors in food, particularly in fresh fruits and vegetables have always given me a great deal of pleasure. I once went grocery shopping with a younger college friend of mine and when we came out she said "I've never experienced shopping done that way before!" In particular she was referring to my happy exclamations over the beauty of the produce section and lovely neat rows of everything. If you have never shopped focusing on the beauty of the experience, I totally recommend it! This is a picture of my Steel Cut Oatmeal which I had for breakfast this morning (and almost every morning). The flavor, color and texture are wonderful; *hubbie* and I very much look forward to this morning meal. Such a healthy and wholesome way to start each day! If you haven't started changing your lifestyle to a healthy perspective yet, this would be an excellent way to start. With a little weekend prep time you can make something delicious that your children will look forward to and you can easily individualize it for different palates. Please don't forget to consider a Vitamix in the near future. Spring, Summer and Smoothies are just around the corner. 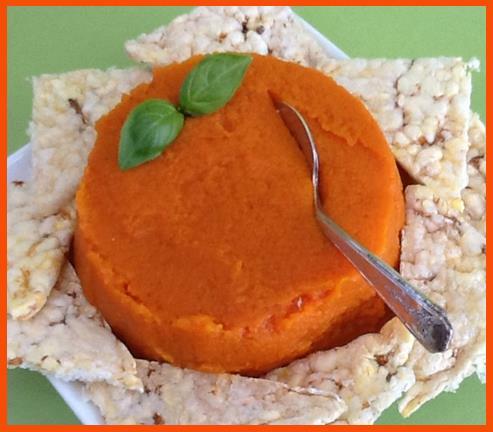 Another superb way to encourage your family to eat and greatly enjoy healthy food! If you like my site and haven't done so already, would you please go to my HomePage and on the bottom click "like". Thanks! 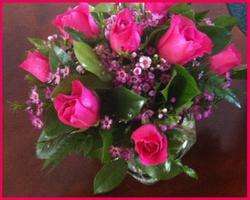 Birthday roses from my dear children across the country! Wish you could see the square glass vase better - it is so EDGy with classic flowers. Love it and loved the day, so sweet and gentle ending at a Vegan Restaurant with *hubbie* and two carnivores. What fun. After all the teasing and jibes at me, they both ended up deciding what they were going to order next time! Thank you Marie and Al for the lovely dinner and gifts. You are very dear to me! I saw this recipe awhile ago when all the football games were in full swing and it looked so much like "Buffalo Wings" made with Chicken Wings that I was really amazed. Never a "wings" fan myself, my *hubbie* used to love them, so I thought it would be fun to make this healthy mock version for him. What a success - there wasn't a crumb left on the plate - his plate or the serving platter. In fact, he liked them so much that he asked me to make them again the next day! They are not difficult although they do required several steps and a warning, they are ONLY for those who love HOT and SPICY. The recipe will be posted this evening. It will be my 100th page! A very exciting time for me. I have been using my Vitamix frequently for new smooth recipes that will be posted shortly. If you do not own a high powered blender I very strongly recommend it and, don't forget, if you enter my Code you will get free shipping to anywhere in the U.S. or Canada. 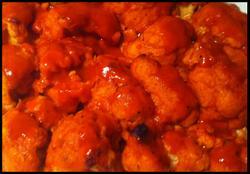 And, if you love Hot and Spicy food, this Spicy Buffalo Cauliflower will quickly become a favorite! Meanwhile, remember that healthy food can be absolutely delicious, fun to prepare and to eat, with many, many health benefits. It's never too late to start! And, as always, make that little extra effort to keep it fresh and keep it gourmet. It doesn't get much better than this! Delicious, warm, crispy and aromatic! 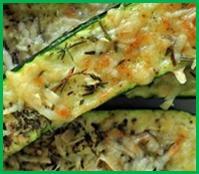 Try serving this to your family, even if they have never been a big fan of Zucchini, they will learn to love it. I would love to credit them. It is now a favorite in our kitchen! It's time to get to some serious conversation about Healthy Eating and a Healthy Lifestyle. There is so much information available, but who can we trust? I have had the January 2014 edition of Bon Appetit, the New Healthy, magazine on my desk for several weeks waiting to find the time to luxuriate in moments of reading. Once I began looking at the recipes I became infuriated! I started to write to you then, but decided to think about it for a few days so that the information that I passed on to you was thoughtful and helpful instead of just venting! Many of us are struggling at some level with improving our quality of life; we are living longer and are interested in living active, productive and disease free lives. We now discover that a lot of the information about good eating habits were very misguided. I always considered Bon Appetit a wonderful resource for learning about good quality food, accurate information and looked forward to their lovely "gourmet" recipes. In many recipes in the *New Healthy* there was way too much oil (fat), added sugar and other ingredients which are calorie dense - nutrition empty. In just one recipe I calculated 444 unnecessary calories! I want very much for you to develop good, strong resources as you maintain or move forward into a healthy lifestyle. For me Dr. John McDougall is my first resource followed by Dr. Joel Fuhrman and Dr. Mark Hyman and of course my two sisters, Betta and Bev, the Green Gourmet Gardener. Remember, we are not talking about *diets* we are talking about lifestyles! So eat healthy, live better and don't forget to take that extra few minutes to add the gourmet touch to all your meals! 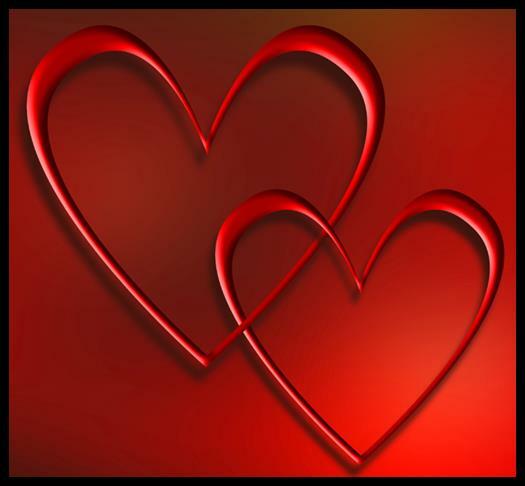 from my Healthy Heart to Yours! Just a short note to let you know that I did get this recipe posted amid connectivity problems that I can't even describe. 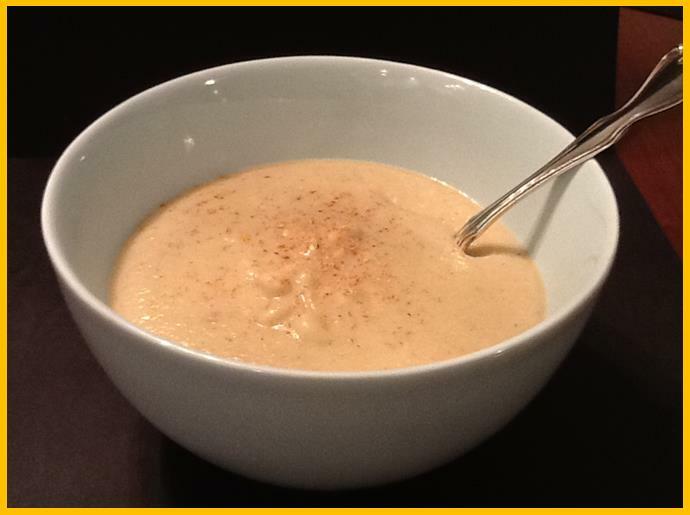 It is so, so very delicious, creamy and smooth and approximately 130 calories, no fat. You can make it in any flavor that pleases you so it's a dessert for all ages, family or company. Wishing you a blessed weekend with lots of Healthy eating for you and for those you love! Tomorrow is a gardening day for us. We really didn't take advantage of our wonderful warm Fall, but we have a few months until the summer scorches everything we plant. My sister, Bev, The Green Gourmet Gardener, reminded me recently that since we started with Mel's Mix two years ago, we only have to add our compost blend to have our boxes ready for planting. So, while I am in the middle of our lovely planting weather, our Green Gourmet Gardener is making her beautiful summer garden plans facing this everyday. When her garden is in full bloom, mine will be a pathetic shriveled mess and I will regret not seizing my moment - so, tomorrow I'll get started. Of course, herbs are growing on my little patio year around - can't imagine how I would cook without them, especially fresh basil and rosemary. I am planning on growing some indoor this year as well. Still working on the fat-free Panna Cotta - it was very good as I mentioned yesterday but I think there are a couple more things to be done that might make it just as creamy as the unHealthy version. I will post the version I just made for you to try soon - your family will love it and then will update you as I progress. Even if you're snow or cold confined, it is never to early to begin your garden plans for the summer. Home grown is so much healthier with much better flavor; even if you are a beginner, the Green Gourmet Gardener will teach you how it's done. Easy. Fun. Great results. 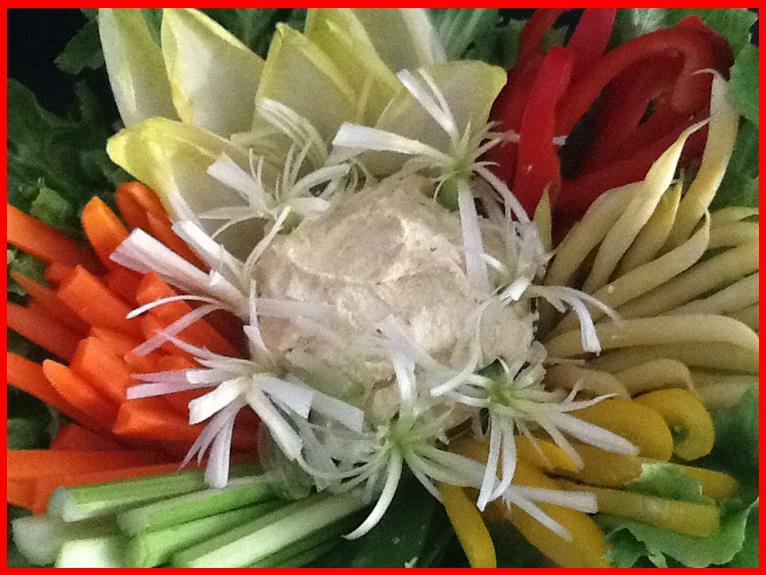 Remember, make healthy choices for yourself and those whom you love; look at Beautiful Garnishes to make your plates lovely adding a little bit of Gourmet, Everyday! from my Healthy Heart to Yours. . .
Oh well. Yesterday was such a wonderful day. Today not so much. Got a later start than I had planned and lost connectivity three times and all the information I had entered. So, I am sitting here in the dark trying yet one more time to get this posted to you. This is Panna Cotta, one chocolate and one vanilla bean, my favorite company dessert because it is elegant and so smooth and creamy, beautiful and consistently no fail. Also, many people have never had it so it is a special treat. The one I made Friday night looked like the vanilla bean (pictured) but slightly pink since it was laced with Chambord. The edible orchid garnish is also a favorite since it adds loveliness to a variety of dishes, from desserts to sandwich platters and beyond. This afternoon I worked on a healthy version of Panna Cotta using Soy Milk and Agar Agar. The results were quite good although a bit less creamy that the original "cream" recipe. Hubbie thought it was wonderful, eating his standing at the counter. This one was laced with a touch of Bailey's Irish Cream. Yummmm. 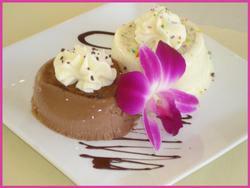 Imagine serving this lovely little dessert with less than 100 calories and no fat! 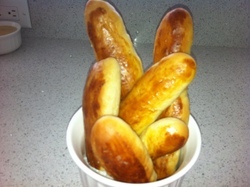 And, these are the BreadSticks which gave me so much trouble preparing for the Soup Dinner Party last week. Pictured are the second batch and tasted yeasty and delicious, crusty on the outside and soft on the inside. Such a treat to have homemade bread once in a while. Tomorrow and Friday I will post the Panna Cotta recipe and tips on how to combine new techniques with the old ones to make your own delicious BreadSticks. I honestly hope that your day was easier to navigate through than mine was and wish you healthy delicious Gourmet dining, Everyday. from my very tired but Healthy Heart to Yours! My goodness, what a day. Had a routine doctor's appointment this morning and after waiting fifteen minutes the nurse came out and told us that they were running an hour and a half behind and would I reschedule. The first happy thing was that the Nurse did NOT recognize me (I've been going there for 8 years); I hadn't been in since we began Healthy Eating! The second very happy thing was that she did weigh me and I have lost 6 pounds since the last time I got on the scale! And, I was wearing jeans and a SWEATER! Certainly not my usual attire for weighing in at home. And, even more good news! I applied to Vitamix to request Affiliate status with them and after waiting several weeks for a reply they said that they would be delighted to enter into this relationship. This means that when you are ready to purchase a Vitamix you can get FREE SHIPPING simply by entering my code in the coupon box on their order page! This would include anyone in the U.S. or Canada. If you live anywhere else, please email me and I will contact Vitamix through my account to find out what they might be able to do. We have had ours awhile; I am not quick to introduce products or websites to you until I am certain they offer the best in product or information. WE LOVE OURS! It's a 300 Professional Series and has a 7 year guarantee. We use it almost everyday and some times two times a day. 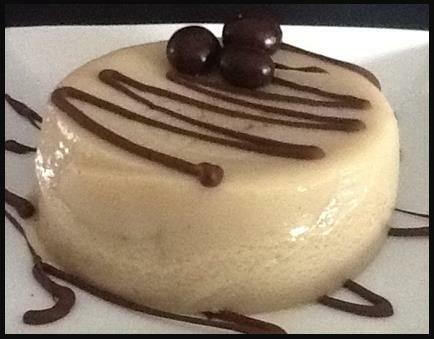 *Hubbie* is begging me to make him Panna Cotta tonight with Soy Milk and Agar Agar. He deserves a little special attention after all the help he provided last week getting ready for The Girl's Monthly Soup Dinner. So off I go to the Kitchen - my favorite place! If you are eating healthy, keep up the good work. It is a challenge in our society to stick to healthy food when so many around us feel slighted if we don't join them in unhealthy choices. If you haven't started, it is never too late to eat well and feel great! And, please, always take an extra few moments to make that little special effort to keep it Gourmet, Everyday! This always has been a favorite month. It is the month of my birthday and my precious twin nephews' birthday and of course, Valentine's Day, which means a beautiful and special dinner. I haven't decided what I will prepare, but lovely and romantic will be the key. Still a bit tired from the activities of the week and the Soup Dinner Party last night, but I always enjoy the "day after clean-up" thinking about the laughter and conversation of the night before and the special relationship that friends share. With my group it is extra special since they are not an exclusive group but are very inclusive and thoroughly enjoy newcomers and guests. We are taking the leftovers from last night's Cioppino and thickening it a bit (adding more carrots plus mushrooms and cooking it down with a few more fresh shrimp and scallops) and serving it over Quinoa Pasta. Instead of a Caesar Salad we will have a garden variety Dinner Salad (tomatoes, onions, cucumber, radishes) with a Raspberry Vinegar Dressing. Still have a couple of the good Bread Sticks (imagine that!) and exactly two Panna Cotta. The Baked Zucchiniwas especially delicious (will post that recipe Tuesday) so I likely will make just one tonight and cut it in half. (Hopefully I will remember to snap a picture to show you.) It is always wonderful to make a dish that can be re-purposed into something entirely different without much difficulty. Wishing you a restful and blessed Sunday to my dear Everyday Gourmet followers! 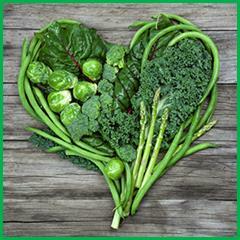 Eat good, nutritious food and keep your heart healthy. So tired. So very tired. The evening was wonderful with two unexpected guests: the daughters of my "excellent hostess" friend (and my walking partner) who lives just one cottage away. They both brought such fun conversation making it lively and lovely. The meal moved along pretty well -- although I had set the table, we mutually decided to eat at the bar where we had our cocktails and Baked Zucchini. 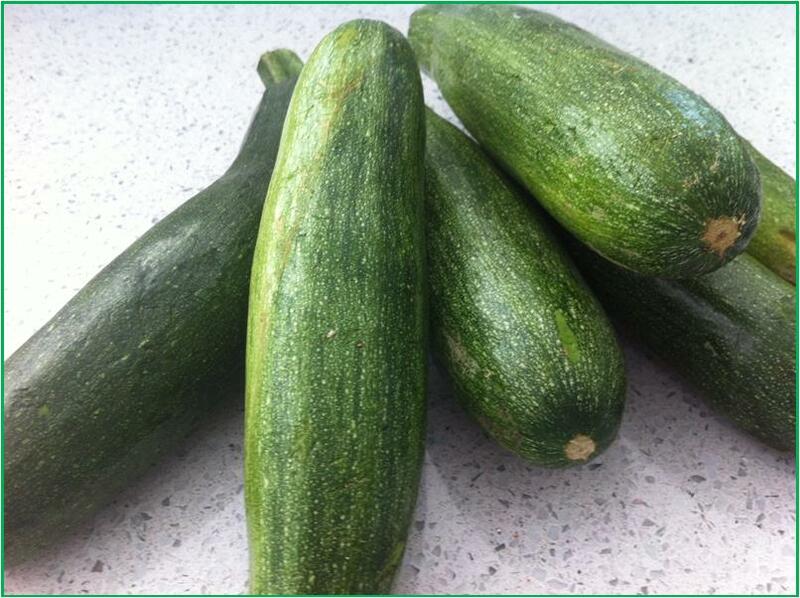 In retrospect, I would have started baking the Zucchini as soon as my guests arrived; it took a little longer to serve that first course, however there were nuts out and my guests were so gracious that they kept the conversation moving even when the food lagged. Everything was set out to toss the Caesar Salad and that went quite well - used the Tomato Rose Garnish and it was a delightful addition to the plate. The Shrimp, Scallops and Mussels needed to be cooked at the last minute which required a little more effort, so I wouldn't recommend this dish for company, to beginning cooks. It would be easy to get frazzled with so much going on just before serving. Minestrone would be a good choice with many of the same components and flavors without the last minute hassle. And of course, the Panna Cotta. Smooth, creamy and luscious. So easy since it's all done, plated and ready to serve. We couldn't resist a Chocolate Zigzag garnish with a couple of Raspberries on each. I am so very blessed to have such dear, smart and wonderful friends - thank you so much Gayla, Chris, Rose, Kay, and of course Kim and Valerie who made this extra special! Keep up that Healthy Cooking looking for ways to make each dish extra special, because you ARE an Everyday Gourmet! You may recall my bread stick (non rising flour) catastrophe last night which ended something like: it's finally rising and I'm going in to check it. When I got to the kitchen, hubbie was busily sauteing vegetables for our dinner and using my bread stick tray (covered with a clean cloth) as a place to hold his spice cans. Oh my goodness. I really didn't know whether to laugh or cry as I peeked under the cloth to see these six long, very flat pieces of dough peering back at me. I batted back the tears, scrunched up my face as hubbie realized what he had done. I baked the bread sticks in the oven at 425 degrees and then, I broiled them for 2 minutes, 1 minute too long and they came out CHARRED. Oh yes . . . absolutely charred. Non edible. I wish you could have seen how relaxed hubbie's face became - totally exonerated. He flattened them but I burned them. I went straight to bed. It was just more than I could handle. So today, the day before my lovely little dinner party, the house is messy and the kitchen looks like a train wreck. The Panna Cotta is made and in the refrigerator, the Caesar Salad Dressing is made, another wonderful batch of Bread Sticks is sitting on my counter, the Fresh Fish is neatly wrapped in the refrigerator and I will have a very busy day tomorrow. I wish I could report to you that this never happens, but it does. When you stretch yourself and your creativity to make a really special dinner, stuff happens. It has, it does and it will. However, no matter how frazzled I am throughout the day, as soon as the doorbell rings, all the hassle is forgotten in the midst of laughter, friends, and the best effort for as special an evening as I could manage. And, Saturday? Well, on Saturday I will be absolutely convinced that this was a wonderful week and that I should entertain more often. If I can, I will get up my courage and take a snap of the kitchen "after" (that would be now). The "before" is posted below. Say a little prayer for me tomorrow, keep eating healthy and please, make the effort to remain an everyday gourmet. You may remember that it is my turn to host our monthly Soup Dinner. 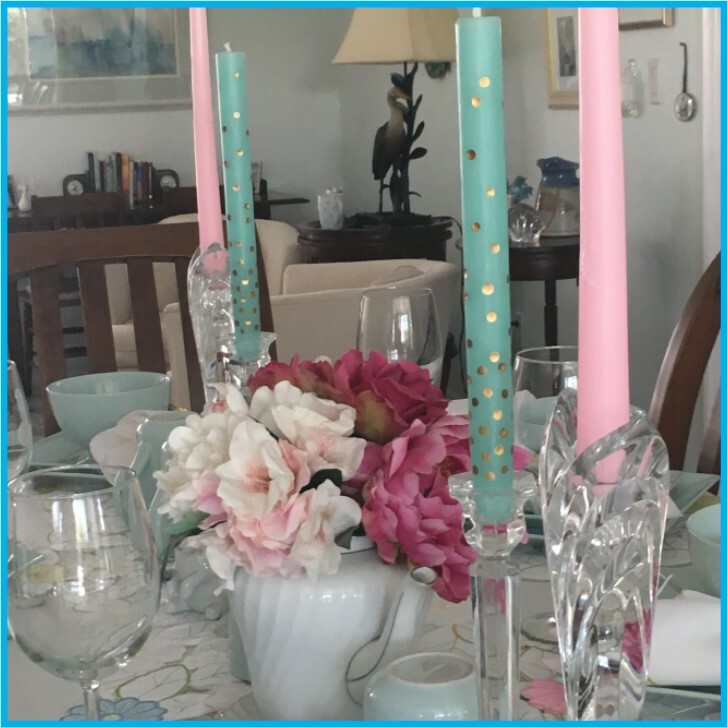 This group is "ladies only" and is a time to prepare a nice meal consisting of soup, salad, dessert as well as an appetizer. With six of us our turn only comes up twice a year and we really work on making it creative and special. All the of the women in our group are excellent cooks and their homes are loved and lovely. We live in a circular community of white cottages, several different floor plans but similar. Our cottages are all white with white tile roofs built around a lovely little lake thirty-five years ago. 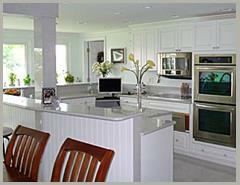 It is amazing how different the interiors are, from my Kitchen Centered (pictured) home to beautiful traditional styles. So, we are almost done with Day Two of Preparations. Last week I planned my menu with a very rough estimate of how to plan my cooking time. Appetizer: Baked Zucchini with a light sprinkling of Parmesan and Herbs de Provence; Salad: Caesar with homemade croutons; Soup: Cioppino with homemade bread sticks; Dessert: Panna Cotta laced with Chambord drizzled with chocolate. I like this menu because the preparation can be spread out and doesn't require a lot of last minute cooking (always makes me nervous). Day One Oh my goodness. 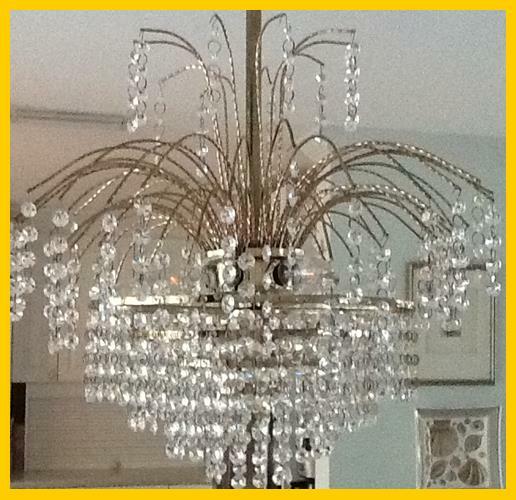 One of my friends told me in conversation that she still cleans her crystal chandelier by hand (instead of spraying it with a dust eliminating spray which is what I had been doing). So, I decided to do it the "old fashioned" way and what a tremendous result. Couldn't believe how each little crystal is a bright prism and reflects colors beyond the rainbow. Time wise: it took two of us (hubbie really is a good guy) over three hours to remove the crystals, wash and dry them and then rehang them. It definitely is well worth it - next time I will not do it the week of a dinner party. Once that was done we cleaned the dining area, dusted the chairs, washed the pictures and just did all the little extras. Next choosing and ironing the tablecloth (found one I had forgotten about so it was like getting a present! 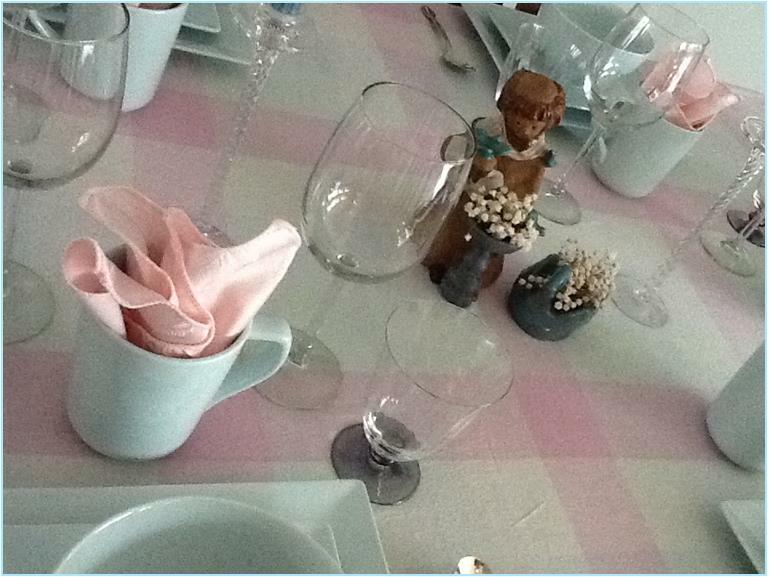 ), ironed the napkins and set the table. Today wasn't as productive as I had planned (hoped). The dough for the bread sticks didn't rise. First thought was to throw it out disgusted but I just wrapped it in plastic and set it on the counter. Thought it could be rolled out, cut and make into some "cracker-like" thing. 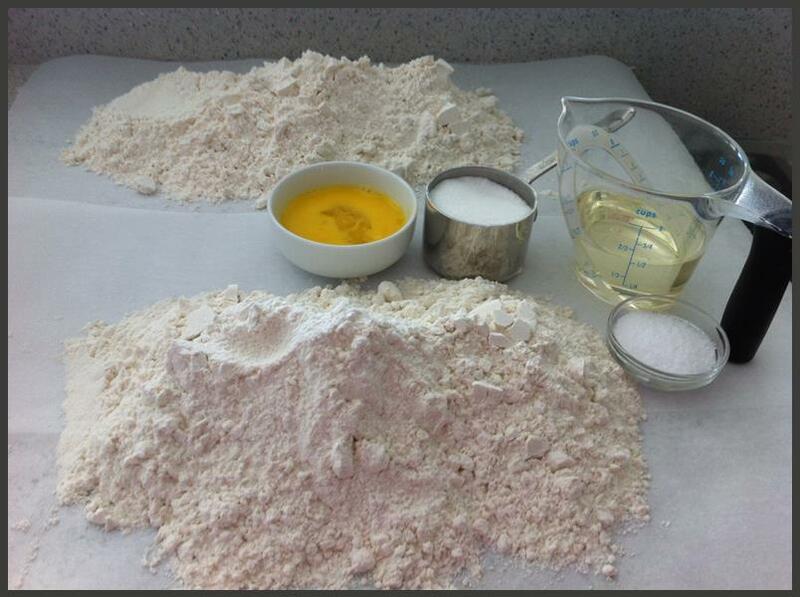 But later I thought that I would make a mixture of more yeast and knead it into the dough. It worked! The rising time was another 1-1/2 hours, but at least it did rise! They are now sitting lined up on parchment paper rising (I hope) for the second time (actually, the third). Scheduled for tonight is making the Panna Cotta (always a good, no fail dessert to prepare ahead of time. I could hold them for up to a week when I made them in my restaurant.) And, preparing the Dressing for the Caesar Salad - want the flavors to intensify before serving it. If I manage those two tasks, I will be back on schedule. Hope you are staying warm and cooking wonderful, healthy meals for yourself, your family and friends. If I can squeeze a minute I'll let you know how things are going tomorrow. Meanwhile, well you know: make your meals healthy and always gourmet, every single day! Connectivity problems today. So aggravating, but I didn't want to let the day pass without posting this simple and simply delicious Garbanzo Flatbread Recipe. It is so good, so healthy and versatile. The picture is of my breakfast this morning, Garbanzo Flatbread with Carrot Butter. Filling, healthy and yummy. Hope you enjoy it - oh and there are only two main ingredients and a tremendous variety of ways to season it. A real delight: to prepare and to eat! Keep it healthy and keep it gourmet, everyday. 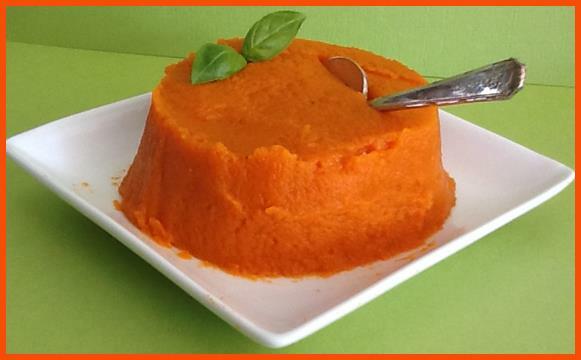 It has been several days since I promised you that I would post the recipe for Carrot Butter - the first time that I made it was this morning. What a pleasant surprise! It certainly doesn't taste like butter, but it does have the same kind of satisfaction you derive from it. When poured into a sprayed custard dish and allowed to cool completely it looks like the picture posted. Very easy to make; we are looking forward to making other variations and keeping it on our "always have around list" for toast, crackers and rice cakes. Hope you enjoy it too and feel a bit adventurous when you make it. Time for my daily walk; meanwhile, keep preparing those healthy meals for yourself and for those whom you love. And always keep it Gourmet Everyday! Just made this absolutely delicious Cream of Broccoli Soup. As many times as I have made this, I forgot how very creamy and smooth it is. Impossible to believe that it doesn't have any cream in it. Really. You could make chunks of lightly steamed broccoli and add it after processing, but there is something so warm and comforting about eating it in it's velvety state. *Hubbie* and I are both tired, so I'm off to eat my bowl of soup along with a side bowl of lightly steamed veggies. Imagining that sleep will come fast tonight. Wishing you blessings and Everyday Gourmet dining! Well, this is a picture of how far along my Creamy Broccoli Soup is. It's just been one of those days. 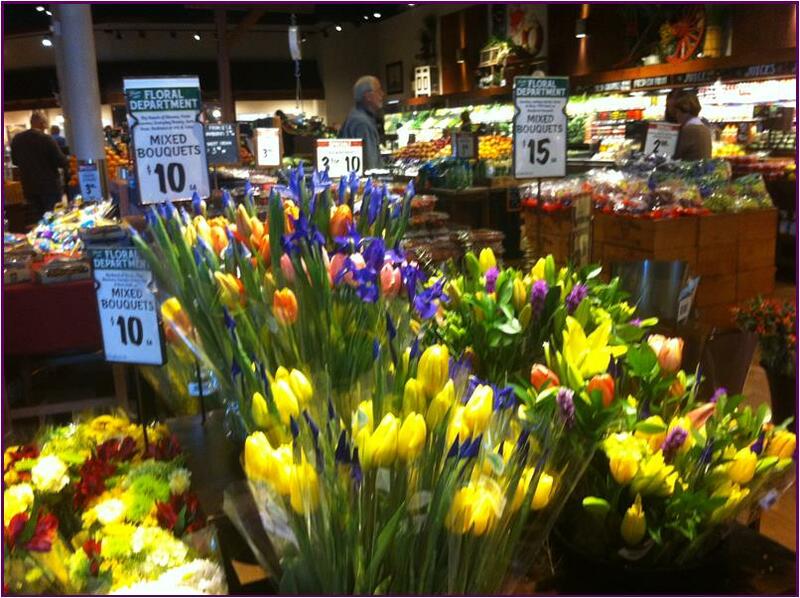 Dear *hubbie* went to the Fresh Produce Market this morning and was rushed because he is taking his Mother to the doctor this afternoon. So he purchased a ton of vegetables and brought them home. When I walked into the kitchen he was stuffing vegetables into the refrigerator without washing/trimming them. We pulled them out at my request (request? sort of) and began making neat little groupings so that I could wash them and put them back into the refrigerator where someone could actually find them. After he left I looked around and the floor (white tile, so practical, NOT) was trashed. Vacuumed. Mopped. Perfect? No, but better. This is why the soup is not in the pot. Pictured are all the ingredients plus 2 quarts of Vegetable Broth and Seasoning. It will come together in less than half an hour. Thank goodness! The Carrots for the Carrot Spread that I want to make and post for you are still crammed in the refrigerator somewhere. Remember, keep it healthy, keep it fresh and gourmet everyday. I managed to get a full day in today - making the creamiest Cauliflower Soup imaginable. This recipe was adopted from the Vegan Coach and tweaked into something really luscious. Follow the directions closely to maximize it's flavor. Quite simple to make in less than half-an-hour, cost effective and extraordinary in flavor. If you are a frequent visitor to my site, you may remember Roasted Tomato Soup which I posted before turning to Healthy Eating. I have rewritten it so that it fits with our healthy profile and believe it or not (amazing to me always) it didn't lose one bit of it's delightful texture or flavor. Why haven't we been eating healthy all along? How in the world did we think that food could only taste good loaded with fat and extra calories? I honestly don't know but am very glad to have discovered it and to be able to pass what I learn on to you. There is so much information available to discover and to pass on to your children. My children have struggled all their lives, as have I, with unwanted pounds. It is so much fun when I see a friend who squeals when she sees me and says you are getting so thin! And this from my truly thin friends. And, I am. But most importantly I have learned to do it the right way - with good, solid nutrition and my body always feeling full (which I like). Tonight I plan to make a Carrot Spread for toast or crackers - maybe one slightly sweet version and another savory. 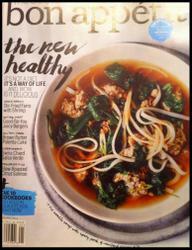 Meanwhile, cook beautiful, tasty and healthy food and be the Everyday Gourmet that you are! I know that I am lagging behind a bit - promising to post recipes and then seemingly not tending to business. I do promise you that I am not being lazy - we are the last ones in the area to take down our Christmas decorations and very late getting Thank You Notes written. Tuesday the decorations got packed for another year and this afternoon we managed to complete our notes (we = I write and address them, hubbie mails them). Finally we are caught up on "house stuff" and the recipes should be posted regularly. Cooking Dried Beans was posted this afternoon; if you are unfamiliar with using/cooking dried beans, please go to our Cooking Dried Beans page. Even if you are an experienced dried bean aficionado take a look at the page and let me know if you have tips or info to add. Many can benefit from your experience/knowledge. My turn to host the Soup Supper Club is coming up at the end of the month, so now is the time to research recipes. If you have any Vegan or Vegetarian Soup recipes that you love, PLEASE email me. and please don't forget to go to the bottom of my homepage and click "Like" if you do! Busy day. Have recipes to post but before I do I thought it would be a good idea to talk about cooking your own dried beans. It occurred to me last night that many of you are still purchasing cans of beans, which is ok if that is all your time permits. Some of you may not be cooking the dried ones since it does require more time and a little know how. So, tomorrow I will provide you with all the information you need to feel confident about the process. The really great part of cooking your own is that you can have the consistency exactly the way you want it. For example, when I am cooking Garbanzo Beans to make Humus or any dip, I cook them longer so that they are softer and can be processed into a smoother texture. When I cook them to go into salads, soups or chili, I like them just a touch under cooked (they continue cooking in the soup or chili). Another benefit is that they are MUCH cheaper. Less expensive plus better result. The decision is easy IF you can make the time. Check back tomorrow and I will have it posted. 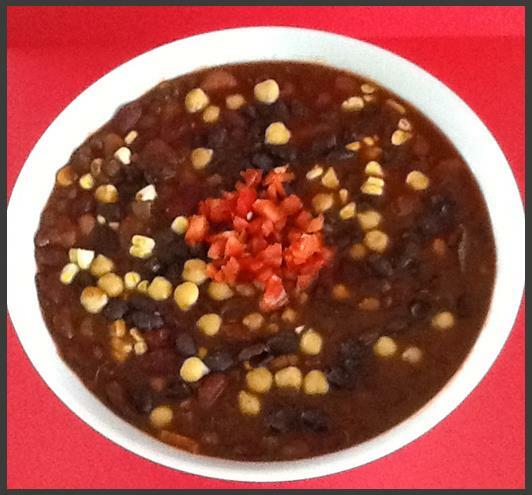 Just finished posting our wonderful Vegan Chili Recipe. Happy for you and happy for me, since we always cook our recipe just before we post it so I remember to remind you of the little Idiosyncrasies of each recipe. Hubbie will be having this for dinner tonight spooned over a Baked Potato with a Salad. I'm having mine on a bed of Lettuce which makes my mouth water just thinking about it. And, since this recipe makes sixteen quarts we will have it in the freezer for many quick meals over the next two or three weeks. It looks like so much food when we put the quart containers in the freezer and we are always so surprised at how fast we go through it. Who doesn't love really delicious, homemade food in a hurry?! Just a reminder: our Black Bean Brownie Mix can only be purchased at our local Health Food Market, Choices, or from my site. Just click the A Little Shopping bar from here or from my HomePage. Also, if you are looking for that special Valentine gift for the cook in your life, consider the Everyday Gourmet Apron. It is available in a wide variety of colors with Everyday Gourmet monogrammed on it. The black version (not posted - given as a gift from me before I could even snap a picture - works great for guys!). Just email me and I will be certain to get it for you - that goes for any color, really. Our beans are soaked, cooked and we are ready to start. Soon those warm deep Southwestern aromas will be filling our house and seeping out the door. Hubbie always says he can smell it as soon as he gets out of the car! Will post the recipe as soon as we are finished! Pink Lemonade Frosting is the perfect addition to a Pink Lemonade Cake. Softly lemony and sweet. 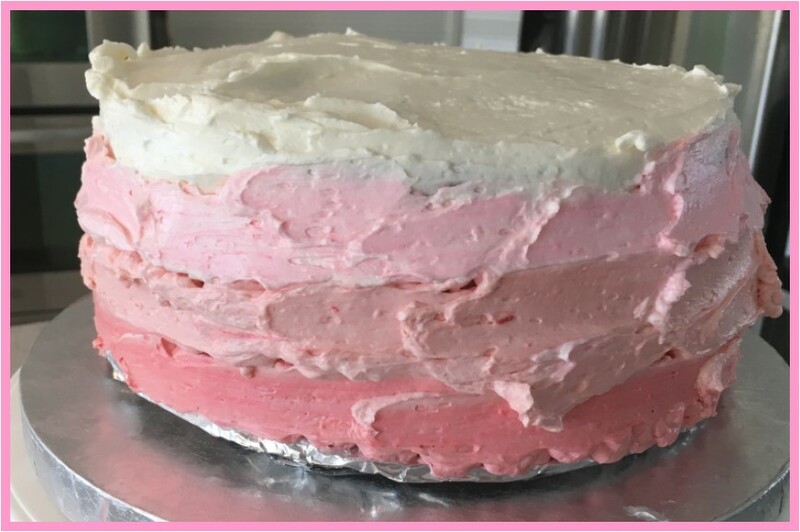 Continue reading "Pink Lemonade Frosting"
Cook your way from ordinary to gourmet with healthy, tasty recipes, cooking techniques, beautiful and delicious. Learning our basic cooking techniques will move you from ordinary to extraordinary! Continue reading " Healthy, tasty recipes, beautiful and delicious "
Continue reading "Applesauce with Pazazz"
Vitamix is a high powered blender that will change your life. Wonderful for Smoothies, Soups, Sauces, Chopping Nuts and Dressings. It is the blender of choice for Professionals and Home Cooks. Homemade Roasted Tomato Soup is so healthy and delicious. Why would anyone just open a can when this can be prepared in minutes and even frozen for later quick meals? Continue reading "Roasted Tomato Soup"
This Tuna Salad recipe is scrumptious served in a bowl or can be broken down into a spread. You'll love it and never buy a can of tuna again. Salads, crunchy and refreshing, can be so satisfying, whether a lovely side salad or a main dish meal. 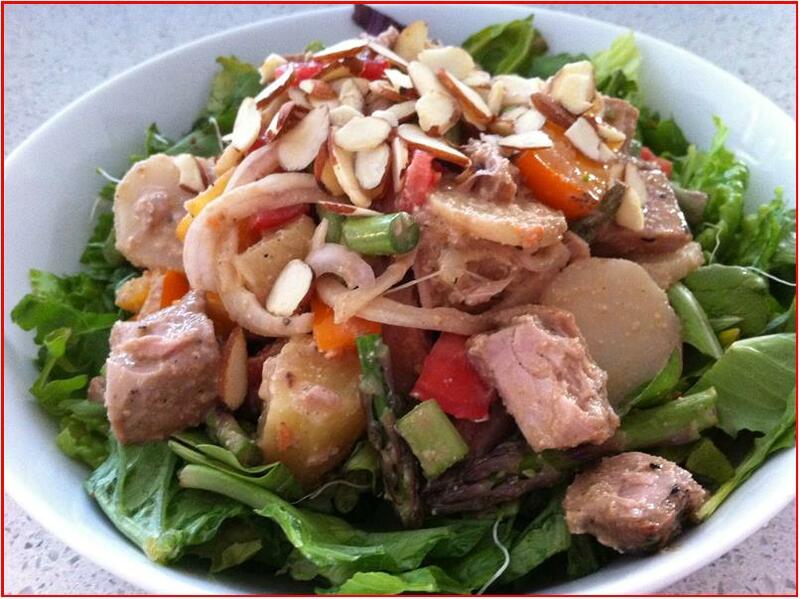 Grilled Tuna Salad is a lovely, healthy and tasty dish for Healthy Eaters and those not so much. Cool, crunchy and filling, it is perfect for a family or company meal. Purchasing Healthy Food can seem like a daunting task when first beginning a healthy lifestyle. We show you how to start with some easy tips. Continue reading "Purchasing Healthy Food"
This delicious Braided Bread is wonderful, warm fresh out of the oven. The process requires several steps which are easy and no fail if you follow the detailed instructions! Vegetable Broth or Stock is very easy to make using bits and pieces of raw vegetable most people consider waste: peelings, onion/garlic skins, lettuce cores and bit, broccoli stems and more. Steel Cut Oatmeal is a wholesome, nutritious breakfast that everyone in the family will love. 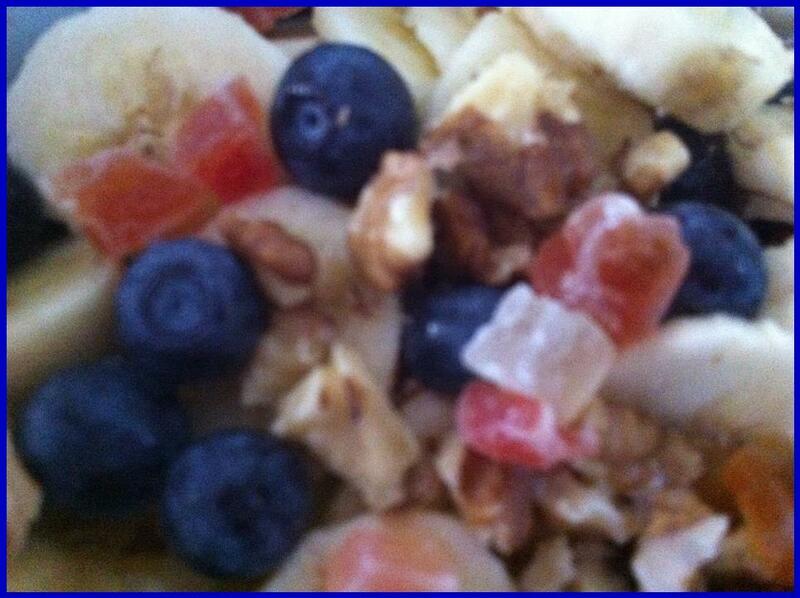 Make ahead recipe is the healthy alternative to the prepackaged, convenience breakfast foods. Continue reading "Steel Cut Oatmeal"
Buffalo Cauliflower Wings are amazing looking very similar to their less healthy alternative. The are hot and spicy and should not be eaten by those who like things sorta hot. Easy and delicious! Continue reading "Buffalo Cauliflower Wings"
Zucchini Crisps are warm crunchy sticks of zucchini that are a perfect appetizer. So easy to make - just place them in the oven when your guests arrive. 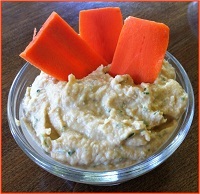 Zucchini Mold Dip is delicious, nutritious and tasty with fresh from the garden flavors. It's easy to make in a multitude of shapes and sizes or can be served as an individual salad. Panna Cotta is a little bite of heaven, which can now be made fat-free and guilt free. The flavor possibilities are endless from extracts to liqueurs. 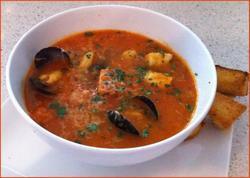 This fish soup is a delicious way to utilize the fresh catch from your country or region. A version is familiar worldwide and is very, very good, even for those who believe they don't like fish! Continue reading "Cioppino Soup Recipe"
Whether you eat Garbanzo Flatbread straight from the oven, toast it for breakfast or use it for pizza, you will be amazed how healthy and tasty this flatbread is. And, so easy. 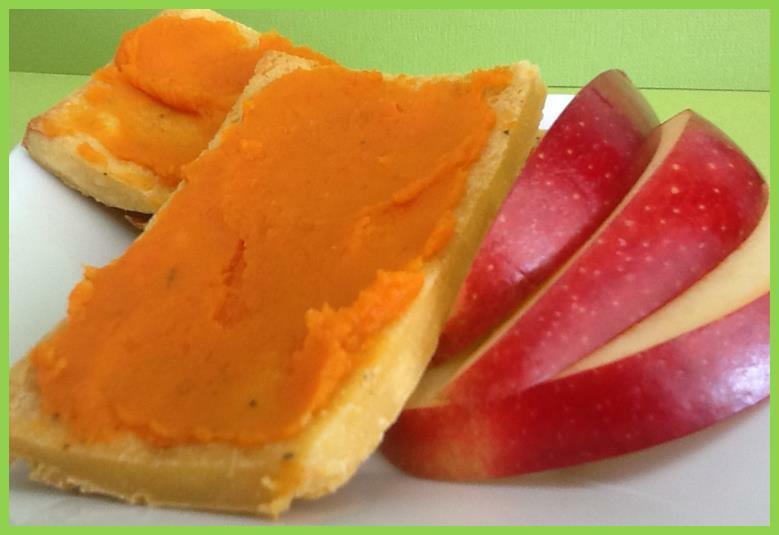 Whether you make it savory or sweet, this Carrot Butter easily replaces all the high fat butters and spreads we were accustomed to. What a wonderful way to get kids to eat their carrots! 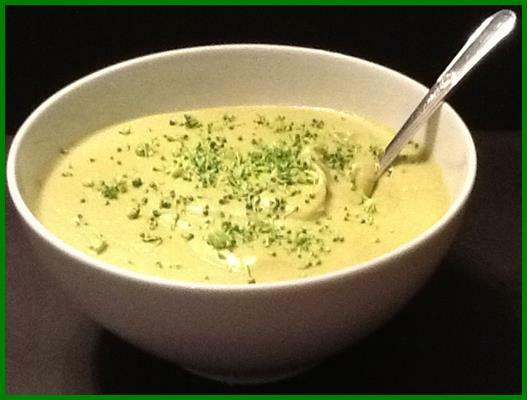 Our Broccoli Soup can be made smooth and creamy or chunky. It is very tasty, very easy and inexpensive. This soup will be on everyone's favorite list!